Guildford Games Club – Page 3 – Club playing miniature wargames in Guildford. Mondays 19:30-23:00. This time we’re looking at the Chaos Cult lists. Those dedicated to one specific Chaos God and benefitting and losing out from doing so. Each of these lists is fairly different in approach and each of them has an iconic stand out unit that the armies are built around using. They all have access to Daemons (and the options for using them as laid out in the Chaos Undivided article) and should make use of them. Many thanks to Nitpick, Apocolacyntosis and Jimmyzimms for the images this time round too. There is one, big standout rule for these lists though that had a large, visible impact on how they play. The core troops of all of these lists (Thousand Sons, Plague Marines, Berserkers, Noise Marines) as well as many others are all fearless and thus get all sorts of exemptions from the normal morale rules. They can still have their formations broken (and thus lose the activation) but they cannot be removed due to blast markers nor from combat resolution, meaning that you have to kill every single one of them to destroy the formation. This makes them able to take dangerous risks with engagements (because even if they lose the don’t suffer extra casualties), makes them great as the BTS (you have to kill every one of them) and means they can take and hold ground exceptionally well (because they don’t have to leave the 15cm or even 5cm of an enemy after losing an engagement, so they can stand somewhere – like an objective – and still block movement towards it even after losing and force the opponent back out of their ZoC). Fearless gets better the tougher your models with it are and at worst the marines have got good saves and in the case of Nurgle and Tzeentch fantastic saves. There are downsides to fearlessness though. In formations where you have a mix of fearless and regular troops if you do take casualties from combat resolution or blast markers then you have to assign those casualties to the non-fearless units which can strip away things like your Rhinos or upgrades that you relied upon for mobility or tactical options or combat punch. Another good thing to note about basically all of these lists is that, with very little extra painting or modelling and maybe a few extra purchases they can stand in as fantastic, colourful Black Legion armies too! The death guard are slow, grinding and tough and bring a variety of barrage weapons making them feel like an implacable wall. Your units tend to being tougher than the equivalents in other lists and favour shorter ranged, high power weaponry and your army special rules give you a bonus on Marshalling and lose the ability to March so stopping your army from moving is nigh on impossible…it just wont be moving quickly. First up the army lacks ways of entering the table. It has several teleporters (Terminators and Plague Zombie Infestations being of note here) but has no air assaults nor the ability to orbital drop so you will be walking and driving most of the way to your enemy. Note that Rhinos and Predators are the fastest ground units available to you! Let’s spin around and look at what you do gain from this slow speed. Your core unit is Plague Marines, 3+ armour, 3+CC, 4+FF fearless infantry, you get 7 and a champion for 300pts and can mount in Rhinos (recommended!) to make the formation 340pts and a tough, reliable core to your army. Able to engage and fight well, hold ground and survive due to their armour and fearless. You want these and will need to learn what you want to do with them as they are a core requirement to unlocking other options. As firefight support they work well and are capable of making risky engagement on their own due to being fearless (note that they will lose their rhinos to blast markers/lost combat resolution though). Get them forward and jam up your opponent’s lines with them. They have nothing to use in the shooting phase so they should be doubling every round to get where they need to be and taking part in as many engagements as possible. For other upgrades you can swap up to 3 stands with death guard havocs, giving a 2x45cm guns and a fantastic FF3+ for 25pts. If your points will stretch this far I do recommend taking these (but rhinos come first! 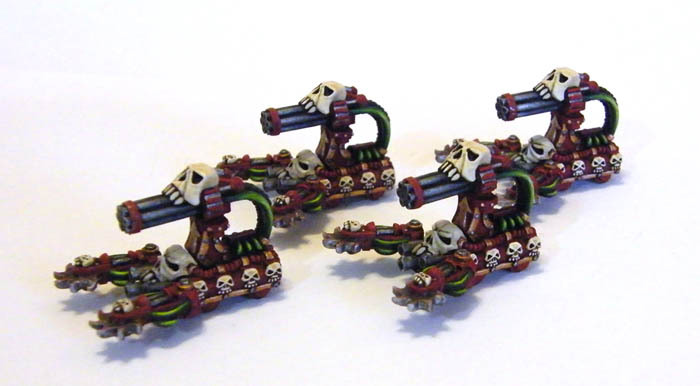 ), adding Vindicators can also be an appealing options. A bit pricier and will slow down your Rhinos to the speed of the Vindicators 25cm though. In return you’d gain up to 3 30cm ignore cover shots and play into that feel of an advancing siege wall. The Death Guard Defilers come with a different weapon load out to standard, including a 2xAA5+ gun. Making a 275pt powerful ground combat unit and bring in large volumes of AA. These are very attractive and I would definitely take 2 formations of them when points allow. They should be able to push forwards and create 45cm range AA deadzones, no one wants to fly into 8xAA5+ shots before making their attack runs from the air! For these I recommend moving them forward and hiding behind terrain, trying to prevent enemy line of sight, then if an oponent comes within 40cm of them you can engage (because of Infiltrate) into B2B through the cover you’re hiding behind (because of walker) and make maximum use of those powerful CC macro weapons. The formation only has 4 models and I would recommend against adding more Defilers to it because of the cost and instead focus on keeping it out of sight of the enemy so it doesn’t get suppressed or broken with blast markers. AA is important and for your Death Guard’s limited speed it is even more important to be able to prevent your enemy being able to fly in and attack with impunity as often your core forces will not be able to divert themselves to deal with fast moving air assaulters. Your Terminators can teleport and this gives you a rapid strike capacity that your army lacks otherwise. Get them where they are needed deep in the enemy half. 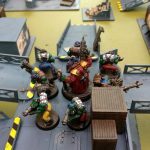 The big advantage here is fearless, this makes your Terminators vastly more survivable than regular Chaos Terminators and means losing an engagement or getting broken with blast markers is considerably less of a problem as you won’t be wiped out by putting more blast markers on you. They are expensive however and if you feel confident with the rest of your advance can probably do without them. If you do take them their best targets are enemy artillery or ideally their BTS – unless the BTS is skimmers or something CC resistant. BTS can be hard for you to score and terminators are your best way of getting it. Looking at your more unique units, Plague Towers, Plague reapers, Corruption Engines, Blight Drones and the Infestation they offer useful things, especially the Plague reapers, being a baneblade equivalent with a short ranged 3BP ignore cover disrupt gun and plenty of other short ranged shots for both AT and AP as well as fearless having a few of these running around to bulk up your activation count for 200pts is a good option, especially for short ranged grinding around the middle of the board. Blight Drones are…kind of like worse land speeders. Slower and without scout they don;t hold ground so well and their guns while good are not standout. They do however work well as a counter to enemy scouts as they are pretty hard to take down, are decently fast and have better guns than most scouting units. I think you can leave home without them but they do add in additional options for hunting the enemy down or keeping them away from the core of your army. The Plague Tower provides long ranged firepower! A huge boon! But it’s expensive and only available as an upgrade making whichever formation with it really costly. It is a transport however so maybe some use in putting it with a core plague marine formation as then you can save on the cost of rhinos. I would not add it to a group of contagion engines though as that formation as a whole would be very slow, vulnerable to suppression (as the smaller engines are easier to destroy) and have issues getting all of its guns into a shared range to take advantage of their combined barrage. The real standout here is the Infestations. A semi-random number of fearless, cheap and utterly disposable bodies. Teleport them onto the table in a position not to fight (they’re pretty hopeless) but instead to gum up the works of your opponent. Slow them down by forcing them to kill their way through multiple stands of blocking infantry. The key to using the zombies is spreading out widely and trying to use terrain to block lines of sight. Try to prevent the enemy being able to see more than one or two at a time with any given formation so they can’t just blow away a whole lot in one go. If the enemy clipping engages them then their fearless means they can’t chase them off. They can simply stay where they are and are not destroyed for being within 15cm and they still have their zone of control. The zombies are a key element because of the way I suggest playing the Death Guard. Your army itself is specialised in close range grinding. Your opponent will likely NOT be good at this and will want to avoid it where possible. Your job becomes forcing them to do it. Slow them down with zombie walls. use your Plaguehound and Blight Drones to kill enemy fast movers and scouts. Your shooting is probably best spread around too – aim to destroy one or two transports from each enemy formation rather than devastating one formation a lot. This both slows them down (or they risk losing models by leaving them behind) and places blast markers on them to help you win engagements later. Place your objectives near the middle of the board so you can reach them and try and get them lined up near to the enemy Blitz too, make a small area of the board your focal point and flood it with really tough short range killers. Then use anything you have that is fast to bully and frustrate enemy fast movers. The Daemons are still useful to you to summon for many of the same reasons as outlined in the first chaos article. In your case however the Daemonic Beasts are what I recommend, not the plague bearers. which can be a bit of a shame but the plague bearers suffer from redundancy with your already really tough and good CC troopers while the beasts give you the ability to engage out to 40cm with still good CC troops. That’s not to say the plague bearers are bad in any way, they are still useful even in the core death guard formations as they bulk numbers and give more attacks, they are just less unique as their unique selling point is a little bit redundant with everything else around them! Don’t forget aircraft, having the ability to reach out and strike with your own is a valuable tool, especially for an army as slow as your can be, they are probably more important than they would be for someone faster. Use them preferably inside the air cover of your Defilers (so they don’t get easily lost to enemy interceptors) and use them to damage and break enemy flankers that might be coming round to score objectives against you. Your opponent is likely to know you’re fairly slow and spread objectives widely to make it hard for you to stop them capturing them. use your aircraft to try and protect those far flung objectives in corners etc. These servants of Slaanesh are fast and hard hitting whilst retaining the standard toughness of any space marine. Their specialty is in an abundance of Disrupt and First Strike as well as fast, ground based unique units. These qualities make them good at alpha strikes and supporting fire. 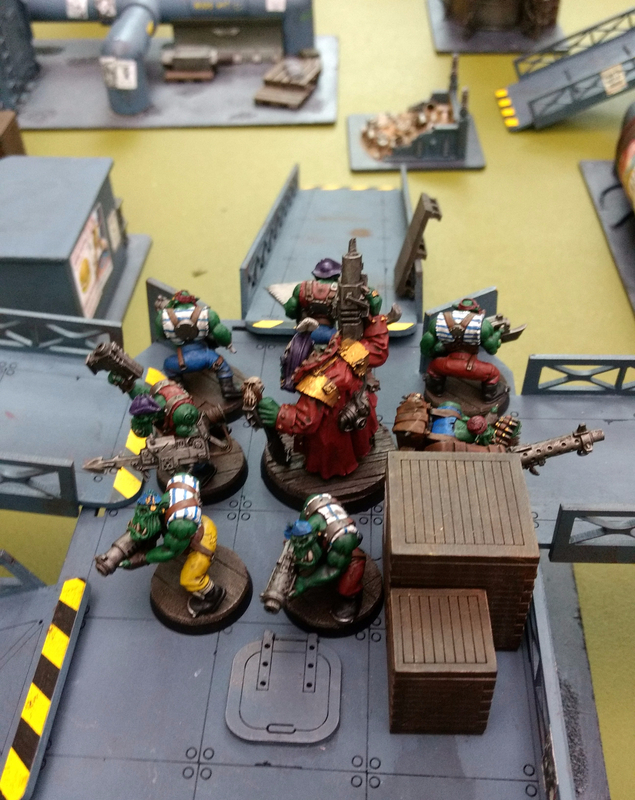 Look for ways of getting your specialist fast movers into support fire range of multiple targets and engaging those targets with your core Noise Marines! Note that you have smaller formation sizes than most of the other chaos lists and fewer options to add more models. 6 is Slaanesh’s number. Unlike the Death Guard previously the Emperor’s Children retain the different ways of entering the table that the standard Black Legion have. Teleporters and the ability to drop in with Dreadclaws from orbit. However they are not so able to bulk up their formations like the Black Legion drop troops. Some interesting options become available with this orbital feature however, for example 3 formations of Noise Marines in dreadclaws costs 305*3 = 915pts…not cheap but dropped on turn 2 right on the opponent’s blitz/triangle of objectives and within 15cm of each other means you can bombard, drop, summon daemons and engage then get potentially all three formations to shoot into the same engagement (one engages, 2 support fire) and can potentially keep on getting them to support each other in that one turn. Tricky to pull off but potent, especially as they are fearless! Bear in mind that with Dreadclaws you have a lot of flexibility – they pinpoint drop with no scatter and you can deploy the formations anywhere within 15cm of the landing point. First up let’s look at the core of the army. Noise Marines. These are as tough as regular marines with a 4+ save, reliable (Init1+) and come armed with a short ranged (30cm) AP/AT gun with Disrupt. The gun is nice to have and I’d rather have Disrupt than not have anything but it’s not a particularly potent weapon when considering their normal role. It is however fantastic at shooting enemy formations that are already broken and has some edge cases where it’s really handy to have that Disrupt ability. The real core strength of these guys though is FF3+. Noise Marines are fantastic at firefighting which also makes them fantastic at support firing and their CC4+ means they aren’t vulnerable there either. Even better the lesser Daemons available to you help to make opponent’s trying to lock your FF specialists into CC have a bad time too. This stat line (short range disrupt weaponry, good CC and fantastic FF values combined with fearless and good armour) makes these guys very potent at engagements, so, get them there. Mount in Rhinos and drive forward, orbital drop if you have to. Even better if you can get multiple of these formation all just outside of 5cm of each other (don’t intermingle!) but within 15cm of each other so they can provide support fire and use those values as many times per turn as possible. You also have Terminators, these guys are not that unique compared to normal cult terminators. Their fearlessness is great and first strike firefight is helpful but doesn’t change much how you’d use them. The comparative speed of the rest of the army means the teleport ability is less useful than it would be to the Death Guard. Use these guys how you would other Terminators really. The real stand out unit in the section is the Bikes. Fearless, 35cm speed, first strike FF4+! These are pretty good as a statline but how they synergise with the rest of the list is why they really shine. 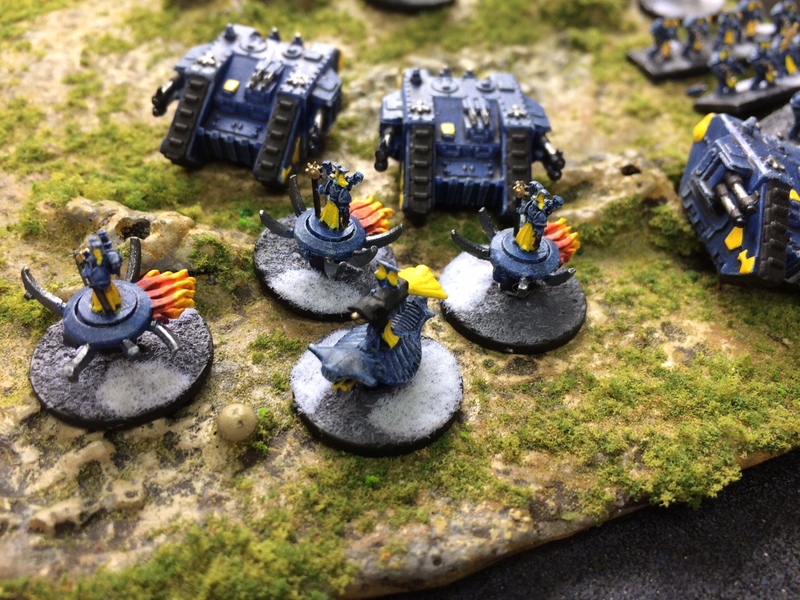 They have a 50cm engage range (35cm move +15cm firefight range), are fearless and get to shoot first…in concert with supporting fire from a Noise Marine formation with it’s FF3+ this is a strong and pretty safe engagement. Even if they lose they only lose models killed by attacks not by resolution, their speed means that if they get chased off turn 2 they can come right back again turn 3 and can even attack the half way line of the board turn 1 (to bully scouts for example) if they deploy on the edge of your deployment zone 15cm on plus a 35cm move plus 15cm firefight range and that’s 15+15+35=65cm and they can add daemons to their number to get the outnumber bonus in resolution. They do only come in 6 strong though so lose effectiveness fairly quickly as they take casualties and their first strike rule only applies when they are involved in the engagement order not when support firing. One thing that will probably stand out to you is that your options aren’t cheap. The cheapest you can get is 4 predators for 200pts…which is not a very attractive formation. 50pts more gets you 6 regular chaos marines and three rhinos which is definitely not bad. Will likely have a hard time appearing impressive but as a solid, reliable activation that can fill almost any role you need it to not something to dismiss. Really though if you want to avoid falling behind in the activation count the place to look is the Titans/Aircraft third. You can only spend 1/3rd of your total point in here but it has some very attractive options. 200pts for 3 fliers is good for buffing the activation count and giving you some air cover or offence, the cheaper spacecraft gives the option to use Dreadclaws, gives a Macro barrage and a pinpoint attack for melting war engines and the standouts are the two smaller titans the Questor and the Subjugator. The Subjugator especially so at 225pts. Both are fast with 35cm moves, have shields and DC so are tough and carry long ranged weapons with their battle cannons – advance+shoot gives them a 35+75cm = 110cm threat range with two shots on 4+ against infantry or tanks. 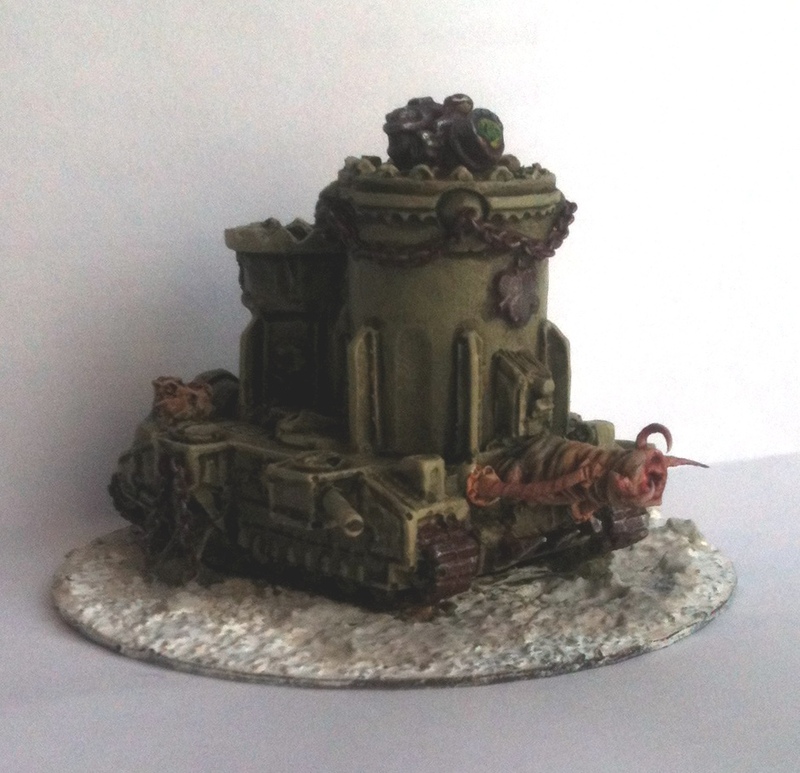 They can dash forward and blow away an enemy transport reliably or place blast markers from across the table. Then comes their unique options. The Questor has twin Castigator cannons for a huge volume of fire (and an FF3+) at 45cm (plus an advance for 80cm threat). The Questor is great at deleting the fast elements of an enemy like their scouts, their cheap disposable activations like sentinels or dethkoptas and it provides good support fire as well as a 5cm engage range much like the bikes. The Subjugator is cheaper and has less firepower…instead it has CC3+ and 5 attacks…two of which are TKD3 so it can utterly shred through formations and warengines and the twin battlecannons means it still provides utility in the shooting phase! A thing to remember with this one is that the effective engage range is only 35cm (as it want to get to CC) but it has the Walker ability so it can fairly safely dash through cover to get there so it can hide behind cover and out of sight and then dash through to CC. Do bear in mind that it can’t CC skimmers though and its firefight is a disappointing 5+. It is cheap though and if it can survive to the end of the game the speed and toughness means both these small titans can steal or contest objectives effectively. Your Daemon options are mostly utility. They give you some ways of counteracting a common enemy tactic. As your guys tend to be so good at FF the enemy will want to get into CC to take this away from you…a thin line of Daemons with good CC and first strike is quite good at dissuading and outright blocking this! This blocking option only need a small number, 2-3 stands of Daemonettes summoned to the formation should be what you need for this. On the attack their range is good enough for your guys on foot (steeds with 30cm move can engage the same things your infantry firefighters can…careful of the 5cm coherency rule though!) similarly with the Daemonic beasts. Considerably less useful for the bikers though, the Daemonic beasts work better for them as their infiltrate means they can go 40cm to keep up. Remember there are benefits to summoning Daemons beyond just kills in combat! Outnumber bonuses and being harder to break due to number of stands in the formation makes them worthwhile! Especially considering the tendency to smaller formations in Slaanesh. 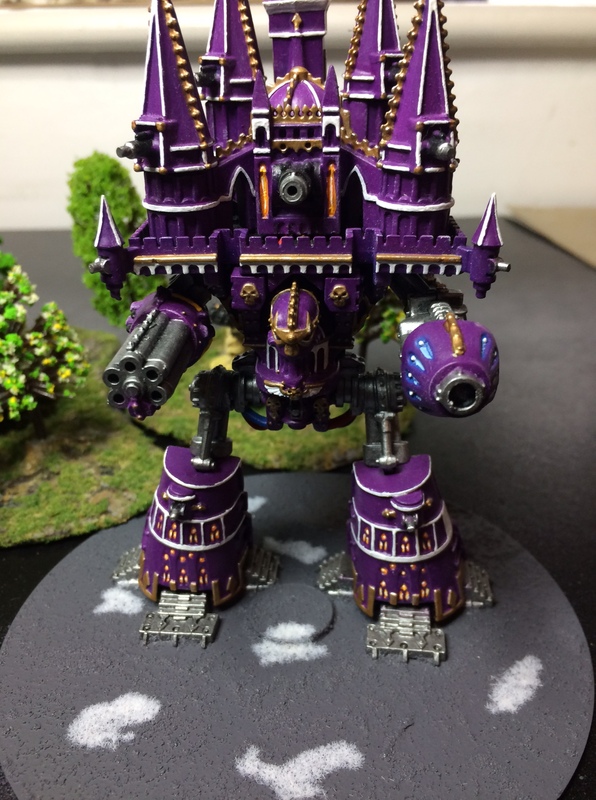 Overall the Emperor’s Children are fast, powerful on the offence and decently tough. They have hard hitting fast units on chassis that take some punishment, abundance of fearless on pretty much exactly the troops you’d want it on and are excellent at firefighting. Your core should be multiple Noise Marine formations and you should practice being able to position them to support fire multiple times per turn if you can. These guys get forward (double in rhinos, dismount within 15cm of enemy, fire) and place a blast marker on an enemy then the fast shock elements like Bikes or Small Titans engage from 30+cm away and destroy the enemy formation with support fire. Remember too that broken enemies are especially vulnerable to your Disrupt armed Noise Marines…Wen not engaging and firefighting you should use your fast elements to strip enemy activations. Identify stuff that is vulnerable to your titans or daemon knights guns and hunt them down. Main thing to look out for is cost, your guys are expensive to go along with their high quality so getting the activations you need can be tricky so stripping them away from the enemy may be your best option. It’s not a particularly unusual play style, you just have some excellent tools for accomplishing it. The Thousand Sons implacable, silent advance, breached only by the cackling of madness and staccato gunfire. You’re playing more like a slower, tougher Emperor’s Children (Some even tougher than the Death Guard! Though on the whole the Death Guard are tougher) with a hell of a lot more Daemons running about the place. So still not a particularly unusual playstyle here. Move up putting out fire to weaken targets, get into support fire positions and engage to drive the enemy away. Pick off smaller formations to build an activation advantage and take and hold objectives. It’s that last bit in particular you are great at. Take and Hold. Your core troops, the Sons themselves, are the toughest basic infantry in the game. Rerollable 4+ saves on fearless troopers is exceedingly difficult to dislodge. Combined with 4+ firefight (and a fairly average CC5+) and the ability to summon in Flamers for more attacks and your core formation is going to be the very crux to build your army around. Getting them where you want them and then letting them do their work and you won’t go far wrong. They’re not cheap but they’re also not that expensive. 305pts gets you 5 stands of sons, a cabal of sorcerors (who comes with a Daemonic pact and thus a free daemon in the daemon pool!) and 3 rhinos to transport them. You can also add in 3 more stands of sons and buy 2 more rhinos taking it to 500pts. You would only want to do this once but it does make a very tough BTS that is almost impossible for the opponent to ever actually wipe out for that victory point. Being as tough as they are and with good combat stats they make great formations for moving onto objectives and holding them. Even broken they don’t have to go anywhere (and if well positioned prevent the enemy getting within 15cm of the objective) and can hope to rally. They will need support fire (or plenty of summoned daemons) to break through bigger and tougher enemy formations and really do want to avoid getting stuck in CC if they can. it’s not the end of the world if they end up there but it des cut their offensive potential. It’s not all positives though (admittedly some of the disadvantages are only disadvantages relative to the positives though…). The Sons lack any ranged weapons for the shooting phase and so cannot place blast markers on the enemy to prep them for an engagement (and thus need support from other units…which you were providing already right!). Further the fearless nature of the Sons combined with non-fearless elements such as the sorcerers and Rhinos means that of you do get broken the extra kills from resolution or blast markers being placed will be forced to kill your sorcerors and transports. This is exacerbated again by how important that Sorceror unit is. The Sorceror specifically has the Daemonic Pact not the formation (unlike other Chaos lists) and so losing the Sorceror means losing access to Daemons on that formation entirely. While the core combat potential is the Sons, the Sorceror is what elevates them to such a potent force. Pay close attention to where the sorceror is positioned (i.e. : never closest to the enemy!) and remember that the enemy does not have to go in a straight line towards you, they can move to flank with a single order so watch those flanks and rears too! You can mitigate the severity of losing the Sorcerors a bit by taking an Icon and adding it to one of the Sons units (don’t add it to the sorceror stand!). The Icon allows you to keep summoned Daemons in the formation at the end of the turn rather than losing them so if you’ve managed to summon in a few Daemons before the sorceror has died you can keep them. This does however put the Daemons at more risk and takes away from the ability to suddenly swing the direction of attack. Like the other cult lists your primary AA is the Defilers, yours are good. Good in CC and not bad in FF and carrying plenty of guns including the 75cm ranged Battlecannon, ideal for plinking away at the enemy to bow up transports or place blast markers from positions of relative safety. Your Terminators are probably the best of everyone’s. Fearless and with extra attacks in both CC and FF (even if with reduced FF4+ rather than 3+) you are able to attack and defend fantastically and teleport means you get where you are needed. Just remember to not let them get stranded out in a corner somewhere, they don’t even have a shooting attack to contribute so be in the thick of the action. Of the generally shared units the last is the Armoured Company which usually doesn’t get a lot of attention paid to it. For the Thousand Sons however it does have a lot more value than in the other lists. Your formations are all pretty expensive (exception: Doomwings) and getting activations into the double digits can be tricky if you take the toys so the option to buy cheap (min 200pt) Armoured Companies can be very helpful. They’re not very tough and don’t have all that much firepower if they’re that small but they are fairly fast and can be good as chaff activations early or to drive and contest the objectives in your half of the board so the enemy can’t capture them. Do try to avoid exposing them to enemy fire though! The main reason you’ve taken them is to put blast markers on the enemy and to bulk up your activation count. Looking at the unique options for the Sons and we see Disk Riders (basically bikes with jumpacks, not fearless and with no shooting, great as firefight support or to engage at range), Silver Towers and Warphounds (yes there are aircraft and bigger titans too but the aircraft don’t do much that’s unique and the big titans only show up rarely and when you take one it’s because you WANT one and rarely will anything else matter in that case!). The Silver Towers bring a lot of firepower on a medium speed skimmer. Four of them put out 12 AP/AT4 shots and 4 MW5 shots, range is good and they can drift forward, fire everything and then pop down behind cover to remain out of sight. 300pts is quite expensive but it does help plug the gap of firepower in the army, due to skimmer and fearless (and 4+/6+ saves) they aren’t that vulnerable in engagements either as they can always force a firefight and even if they lose they don’t get wiped out unless you actually kill all of them. They are brutal on overwatch if your opponent is the kind of person who uses air assaults by the way. Then there’s the Warphound, much like the fantastic Subjugator and Questor of the Slaaneshi forces this is a workhorse – costly at 300pts but fast, tough, good shooting and great in engagements. use it to either engage enemies surrounded by your other troops (so they can provide supporting fire) or have it move up and shot the target then engage the damaged target with something else and reap the rewards of 5 FF4+ attacks in support from the Titan. The speed also helps with grabbing and contesting objectives. You will probably find that there is a lot of competition for the 1/3rd air/space/titan. The units in there are either workhorses like the Warphound or provide cheap, effective activations (Doomwings) or provide a missing capability (Spaceship pinpoints with TK for enemy war engines). Finally there’s your Daemons. You get a load of these free with the Sorcerors so no matter what you’re going to have some! Learn to love them and learn to use them. Tzeentch has access to probably the best of the Daemons anyway. Flamers are utterly brilliant, make sure to hide them behind more disposable troops to let them to their work. Screamers are less exciting but provide a CC threat and good speed making them great to pair with Disk Riders or to wrap around your other troops to prevent the enemy getting into CC with your firefighters. Finally is the Lord of Change. fast with good shooting attacks and great in engagements. An expensive but useful option is to put a Champion in a Thousand Sons unit (I recommend not a big 500pt one if you go for that so you can spread the threat around) and then try to summon the Daemon every turn. On average you’ll roll the 8 needed to summon the Lord and then it can remain on the table due to the Focus it has and it adds a big boost in combat power to the formation as well as adding in shooting attacks to a formation that normally would not have any. Good 45cm MW3+ attacks at that! All in all a very strong, very competitive list. Learning when and where to position formations for supporting fire will be key as will knowing when to focus on putting blast markers on the enemy rather than shooting to kill because your firepower will likely be contained in a few (luckily fairly mobile) formations. Chances are you will find that you will have some trouble hitting the higher activation counts (>11) whilst taking the cool toys so remember to pick up some of the cheaper options in the list to keep on top of that. This is a list that will reward both placing the formations well whilst also knowing where to place the individual stands within the formation due to the juxtaposition of super tough Thousand Sons and important but softer Sorcerors and Daemons. The warriors of Khorne are very much a skew list with extremely potent CC abilities and middling FF and shooting. This heavy skew means that against some opponents you will have a great time (dark eldar will hate you) while against others it can be very frustrating (tau and craftworld eldar particularly). Furthermore it’s a list with an exploitable weakness that gets more easily exploitable the more experienced your opponent becomes. But none of that is what’s going to stand out to you when you first look at the list. The real standout is the CC2+ that is scattered everywhere! Your troops are about as fast as the average, have average firefight values, fearless abounds, well armoured and have utterly fantastic CC stats. Very little is going to stand up to the charge of berserkers, bikes, terminators juggernauts, etc. The real power in the list is how well you are able to get your troops into base to base with the opposition. 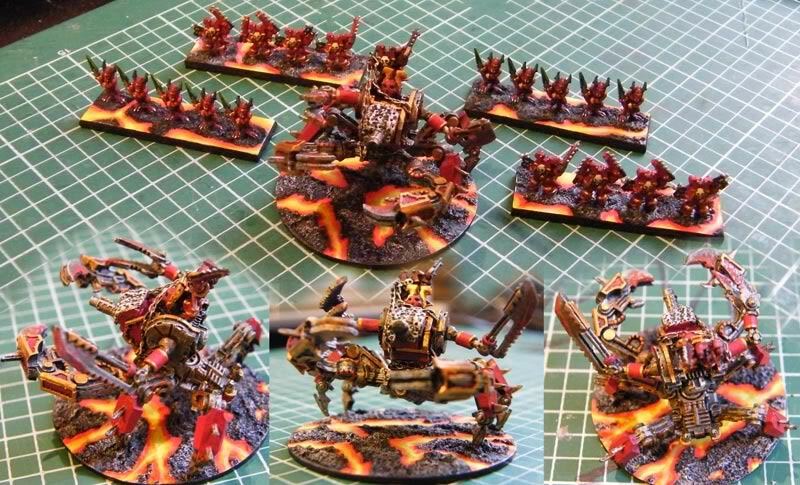 You also have access to various Daemon Engines, providing some unusual units that don’t often become part of the general 40k conversation and so a chance to use some effective and unusual units. In the broadest sense you will still want to prep a target with blast markers, get some support fire into position and then engage. However the threat range of your troops is very short, 15cm shorter than much of the opposition so you may find yourself better served by countercharging an enemy who has moved in to attack you already. Luckily the abundance of fearless means you should not be punished too heavily for losing engagements (beyond the casualties caused by the fighting itself) so adopting an aggressive forward push followed by having your first line pushed back while your second line charges into CC can be effective. Doing this however does require you to know the key enemy combat formations and focusing your attacks onto those. Luckily the majority of your formations are capable of looking after themselves if fighting the smaller chaff elements of an enemy army due to average FF and good armour as well as a surprising amount of shooting attacks. As it will come up a lot when looking at the unique World Eaters units I’ll quickly remind you of why CC is trickier to use effectively than FF. Mostly the issues come up when a unit is only good at CC and rubbish (or even nonexistent!) at FF. Luckily many of your units are not actually bad at FF, just not standouts and you’re paying for that standout capability in CC. First up is simply reach, you have less engagement range than FF units because FF is out to 15cm while CC is base to base only, this requires you to get closer in the first place or means remaining mounted in transports (and thus risking getting killed when a transport is destroyed) to get into range. Note that the Infiltrate ability helps to mitigate this somewhat. Second is tied to the first. Because your threat range is shorter your opponent is more easily able to stay out of your threat range and so the more skilled and mobile your opponent the more readily they can pick battles and prevent you getting yours. Thirdly is the defensive/offensive split. No one will engage your troops in base to base unless they think they’re going to win by doing so which means the only times you will get to use your CC is when you activate and engage to get there while conversely a good FF unit will almost always be able to use at least some of the units better stat in both your activations and the opponent’s. Fourth is supporting attacks. This isn’t such an issue for your army as you’re not terrible at it but support fire only uses FF not CC and so CC specialists with bad FF (such as dark eldar Incubi) are providing very little benefit in the support stages and so your army can find itself with lots of areas of local disadvantage as your opponent can exploit the lack of FF. Finally is skimmers. You can’t CC a skimmer unless the controlling player wants you to (guess what, they won’t want your guys to!) but they can be used to block your movement. Armies like Eldar or tau with an abundance of skimmers will be able to hide their infantry behind skimmer transports making it very difficult for you to get past them to the CC vulnerable units behind. Infiltrate helps to mitigate this. 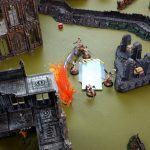 The key element to a well played World Eaters list is what your answers to these weaknesses is. Let’s look at the tools you have to do this! Your core units are Bersekers. Utterly fantastic in CC, coming 8 strong and with average FF they benefit from being mounted in rhinos (for 315pts) to get right into the enemy. Fearless and well armoured too. They suffer from the CC focused issues but 8FF5+ is not to be ignored either. You want to keep them mounted in rhinos for as long as possible to extend their threat range (30cm rhino move+5cm dismount = 35cm CC threat) so it can be worth taking an extra moment before completing your movement to check what enemy AT guns will be able to get at them in whatever position you move them to. If they’re only going to get maybe a small handful of 6+ AT shots maybe it’s worth risking remaining mounted to keep that extra option. They can also be mounted in Dreadclaws and I urge you do this if you can spare points for the spaceship. Dreadclaws are extremely accurate drops (no scatter!) and you can deploy anywhere within 15cm of the drop site and then engage 15cm to CC from there so you can get a potentially 30cm CC threat bubble around any Dreadclaw drop site. Choose those sites well and you can get around many of the CC focus issues mentioned above. Also remember you don’t have to engage in a straight line. If the front of an enemy formation has skimmers blocking your path perhaps run around the side to get past them or dismount from your dreadclaws at an angle that bypasses them. Finally you can garrison which…probably not what I’d recommend but it does have some interesting options if you go all in for it. Three or more of these core formations garrisoned right on top of the half way line puts instant pressure on the middle of the board and creates a dangerous zone for the enemy to enter which can restrict their movement…likely the troops doing this job will be shot to hell and likely wont every fight effectively all game, but in the strategic thinking it also means you can potentially keep the enemy sitting deeper in their own half for turn 1 and into turn 2, giving you a huge amount of board position later in the game, potentially preventing them from ever getting close enough to take your objectives. Risky option though, much safer to buy the rhinos. 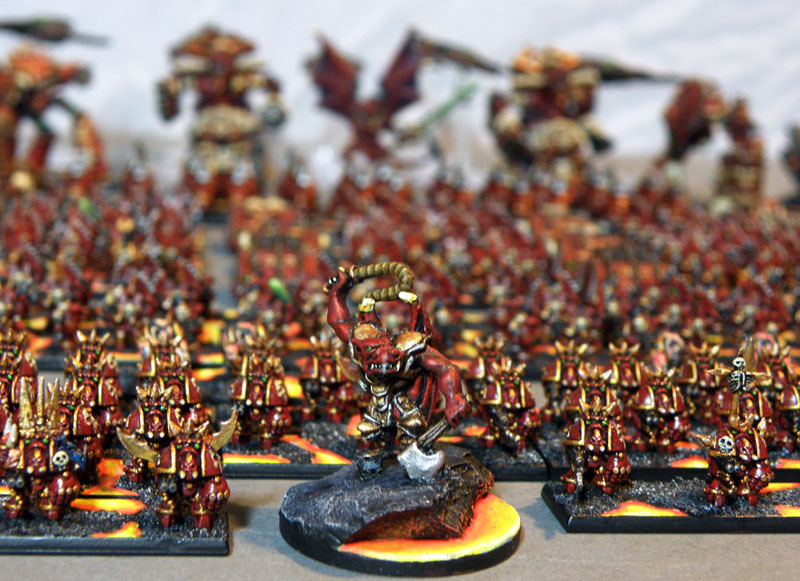 I would forgo the Daemonic Pacts as they don’t add much new capability and I’d rather have points to spend on the other Khornate units and keep these guys lean. Next up are the bikers and juggernauts. The bikers are exceptional (and costly at 350pts) and get around many of the CC focused issues by…not being CC only! They’re fast, fearless, tough, good at FF and excellent at CC. Able to both attack and be your support fire, able to reach further with less risk. Excellent unit, I recommend taking at least one and more if you can! The main strength here is the ability to more reliably attack the enemy than the berserkers. The juggernauts fill a different role to the bikers being awful at FF and better at CC (2 attacks at 3+ per stand) and the Infiltrate ability gives them a 40cm threat range. Big hammer unit that also is able to deal with some of the CC only problems. I recommend keeping a more FF capable unit (say…bikes perhaps?) nearby to help them out if the enemy tries to engage them so you have some good FF support to make up for that FF6+. Both make decent places for Daemonic Pacts too. Your more generic units (terminators, regular chaos marines, defilers, armoured companies) all basically fill the same role they do in any other list. The terminators are probably not particularly standout here as the extra CC killiness is a bit redundant and they lose firepower to gain it limiting their utility outside of the one turn they teleport in even further. The Chaos Marines though are much more useful, fast enough to keep up with your attack and bringing along that support fire and reliable ranged shooting to prep the enemy the rest of your army craves. Defilers here lack AA and are thus less useful than in the other cult lists and while good at CC are kind of redundant when compared to the rest of the already fantastic CC units at your disposal. They do have shooting attacks though. It’s the high cost and small formation size that hurts the Defilers the most – usually they’re worth it despite this but in the World Eaters list there is enough competition from similar formations. 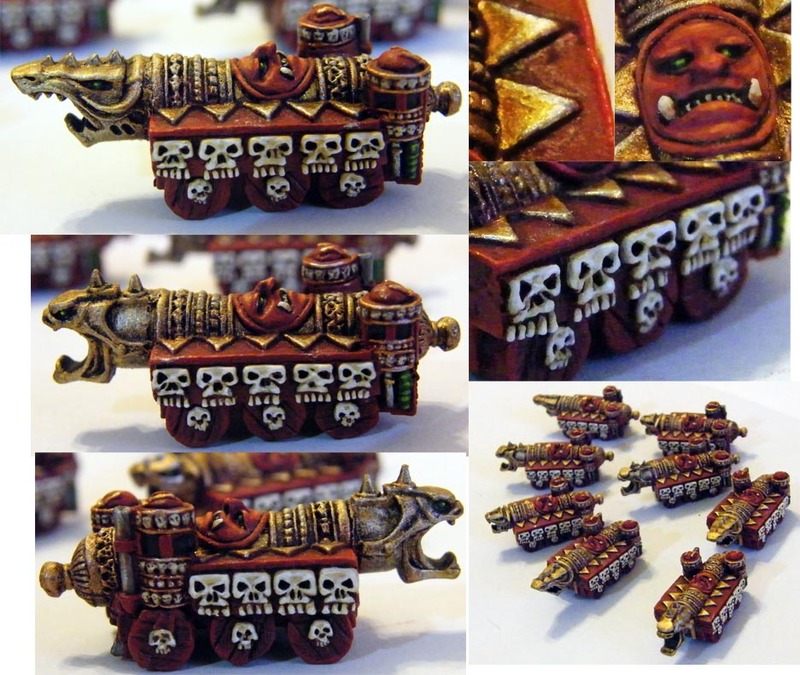 How about the Daemon Engines, Cannons of Khorne and Brass Scorpions? Oh and the Lord of Battle? Juicy and unusual Khornate units probably worth taking just because of their uniqueness. It helps that they’re flavourful and effective too. The Cannons first provide a way of plugging a big hole in the list so far. Potent long ranged firepower. You get 4 for 200pts, they’re fearless and fairly tough (4+/6+) and they can crawl forward 15cm per turn pumping out shots 75cm away with 4+ macro so able to basically snipe off transports and weaken enemy formation from safety. 200pts is also pretty cheap so a great way of getting to activation count from a unit that should be contributing pretty much the entire game and safe most of it. 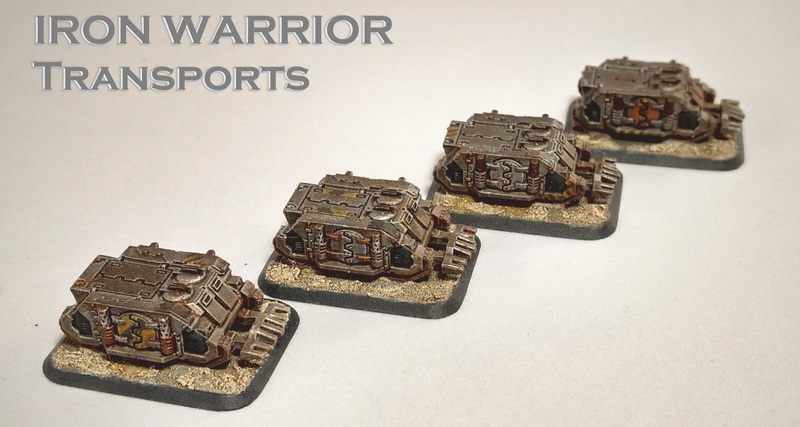 The Assault Engine Pack and Brass Scorpions both perform very similar roles – namely engage for CC around the objectives to clear them of the enemy, they’re great as countercharge units. They aren’t the fastest things on the board (though Infiltrate helps with threat range) but they’re quick enough to get involved at the critical moment. Between the two the Assault Engines are slightly better (though the FF3+ on the Scorpions is very good too) but both fulfil the same niche (tough pressure unit that gets in the opponent’s face and forces them to deal with it) in similar ways so really choose your preference or what points allow. The upgrade to add more Engines to the Assault pack is…expensive but provides a very strong pressure threat to the enemy, shove it down their throats, march or double turn 1 and turn 2, force your opponent to deal with it’s 6 4+ rerollable fearless models. The mighty Lord of Battle is basically used in the same way as in the Lost and the Damned list so I will copy paste myself from there. 400pts of warengine monstrosity, even coming as a terrifying pair for 800pts! It should fairly handily murder whatever it gets its hands on…hands being the operative word here. It’s biggest selling point is being brutally good in CC but it is only speed 25cm so it not that hard to keep away from. If it can’t CC it still has respectable FF and with high DC6 it gets plenty of attacks and outside of engagements has meaningful firepower. It’s just not going to be such a satisfying large amount! It you take it a pair is much more likely to have a major impact but it is a lot of points so it’s a real commitment to take it that way. The alternative is to use it defensively as a countercharge threat, they work better as singles in this way. Get one sat on an objective (such as your blitz!) and anything that is contesting that objective (within 15cm) should also be within your CC engage range of 25cm. If you are determined to use them as an attacking piece then commit to it and force your opponent to deal with them. Double or March into your opponents half and keep pushing on to their blitz. Marching turn 1 and doubling turn 2 means you can cover 75+50=125cm…the table is only 120cm across so you should be well able to reach your enemy blitz, have put blast markers on whatever is protecting it and engage it in CC turn 3, shredding whatever dares stand before you. The real goal is to make the opponent have to deal with you which means you may be able to get that CC ability in action more than once. Overall the Khorne list has some very aggressive tactics, you need to close the space and you need to take the space away from the enemy. Get right into their faces and try to form broadly contiguous lines of zones of control, corral the enemy into less and less space as they try to keep outside of your short CC engage ranges until they can’t run anymore, then cut them apart. Ultimately this means that early on you may find your forces getting shot to pieces or engaged by concentrated enemy forces until the latter half of the game when you can launch your assaults and punish them for their hubris. Of note is that while many of these units are scary and potent…they all share a very similar role, leaving a lot of redundancy in the units available so often you’ll find the few units that work best for your style and just use those, leaving out the characterful other options. Which is a shame. Keep that chain axe singing! Hopefully you’ll have found something useful in there, happy gaming! All pictures provided by the gracious jimmyzimms and Nitpick of Taccomms fame. Thanks you two! Welcome back! This time we’re looking at around half of the Chaos lists available in EpicUK. 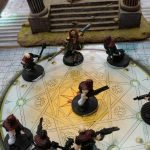 There are 7 Chaos lists and I felt it better to split the article up into two parts. This time covering the forces of chaos undivided – the Black Legion, Iron Warriors and the mad cultists of the Lost & the Damned. Next time we’ll look at the Chaos cult lists because they are distinctly different to these undivided lists due to the abundance of some interesting special rules…but more on that next time! The two Chaos marine factions this week play differently to each other and very differently to the loyalist marine chapters too while the Lost and the Damned are a whole host of weird and wacky. That first difference means they don’t break any of the morale rules and are thus easier to break (normally) and they suffer from casualties in combat resolution and blast markers when broken in the same way as anyone else, which can be especially disheartening for expensive tough troops like Terminators or Land Raiders. Sometimes an opponent will favour breaking these formations with blast markers and then killing them with more blast markers rather than trying to crack their armour. The second however gives you a counter to being easier to break (by having more models they need more blast markers!) and also giving you a lot of flexibility in how to build your formations, what tools to equip each formation with depending on the role you want it to fulfill etc. A lot of these upgrades are fun toys to use too! The thing to be careful about is adding too many upgrades to your formations, you don’t want to spend too much and not have enough points left for buying other formations, remember to aim for 10-11 activations in a 3k points game (unless you have some clever things in mind). The third difference can either be big or small depending on how you’d choose to field your loyalists but this difference means that the traitor legions are less air mobile and have pretty much no ability to leave the table once they’ve arrived on it and less ability to precision drop forces right onto an enemy in response to their battleplan. You can orbital drop but that requires pre-plotting at the start of the game so is less responsive and you can teleport terminators but once they’ve teleported they’re stuck on foot. Apart from the Iron Warriors though your Chaos forces have one big, big advantage. Daemon summoning! Daemon summoning allows you to purchase a pool of various types of daemons and, when activating formations that have bought the ability to do so, summon a semi-random number of them to add to the formation for that turn. The individual daemons themselves are usually fairly potent (if specialised) and provide a variety of useful tactical options, both defensively and offensively. For example you may decide to protect an important formation by activating them early and summoning Daemons into them, bulking up the formation and making it more dangerous to attack, as the Daemons last until the end of the turn they may help protect that formation for the entire turns duration. This is particularly helpful for protecting your BTS. On the offensive this allows you to essentially bring in the ‘support fire’ element that having your formations working together without the need for a second formation. See a target, declare an engagement and summon a small handful of Daemons to add another load of attacks all of a sudden and do what would normally require supporting attacks with just one activation. 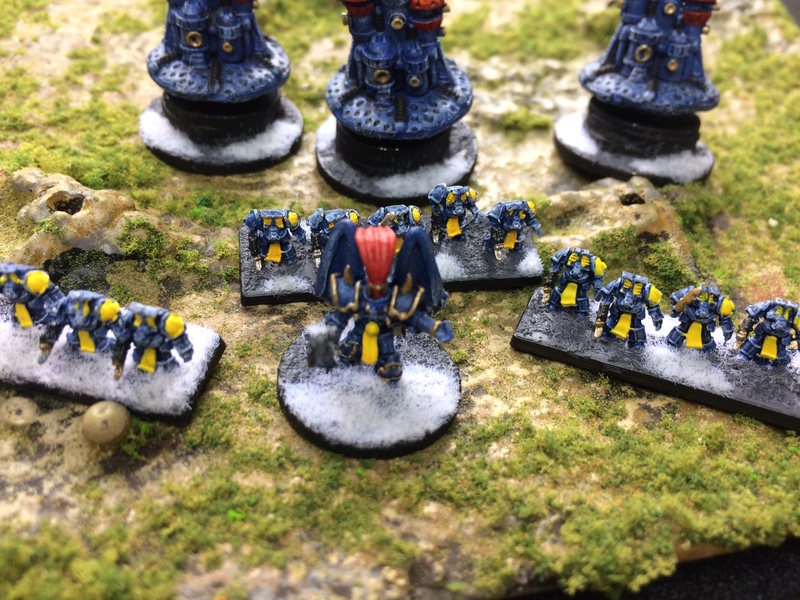 Note: Daemons can be summoned within 5cm of an existing model of the formation…which means you can gain an extra 5cm of range on an engagement for example! Sneaky! Combining the Daemon summoning with the options to make large, more powerful formations and you can create very self-sufficient forces. Now, on to the Lists themselves! These guys are your oxymoronic ‘generic Chaos’. They can be stand ins for any legion or none, make use of Daemons, have loads of war engines, foot sloggers, elites, orbital drops, etc. Broadly this list plays Epic in the normal way, get activations on the table, move them to where they need to be to contest objectives, use shooting to chase off small stuff and weaken larger stuff, organise supported attacks, engage and hold on to the end of turn 3. They have all the tools needed to do this and plenty of fun toys to use to get there too. The big selling point here though is the availability of Daemons. The list is well tailored to make good use of them. Note the Daemonic Pact upgrade for 25 points – it allows you to summon Daemons in the upgraded formation AND gives you one free lesser daemon to summon. Buying a few of these Pacts will give you to core of your Daemon pool and then maybe spending a few points elsewhere will get you everything you need to be able to bring on large forces of Daemons where you need them and then return them to safety for appearance elsewhere next turn. It is strongly worth considering which type of Daemons you want. The Greater Daemons are potent but require using a Champion upgrade as a sacrifice (or an average 4d3 roll) and you can only have one on the table at a time. Take one because it’s cool and not that expensive for what your get. remember, the average on 4d3 is 8 and having a Champion gives you +2d3 to summon meaning on average you’ll succeed in summoning your Greater Daemon and all of them come with a Daemonic Focus which means they can choose to stay on the table at the end of the turn. This means a turn 1 average roll adds the Greater Daemon to your formation for potentially the entire game, not bad for 100pts. The lesser Daemons are your ‘bread and butter’ here and there are a few stand outs. The Flamers of Tzeentch are probably the best by being a focused FF unit allowing them to be useful on both offence and defence with their main liability being a poorer 5+ save (which you get around by hiding them behind your 4+ save chaos marines!) otherwise they’re granting you 2 4+FF attacks each so just dropping in 3-4 into a formation gives you a scary 6-8 more attacks hitting on 4s! The Daemonettes are good too, suffering from the problems of being a CC focused unit they make up for it with a 3+ to hit and first strike allowing them to shred opposition before it gets to attack back. The Bloodletters are much the same as the Daemonettes with more attacks but only on 4s and suffering from the same CC only problem. The Plague Bearers are a different style of unit, with their strong 3+ save they make a great frontline and are fantastic as a defensive summon to protect your formations by being able to just bounce 2/3rds of all hits. A mix of Plague Bearers and Flamers probably gives you the most variety and options though you’d want the ratio to favour the Flamers. Taking only Flamers is always a good option. Otherwise I personally prefer the Daemonettes to the Bloodletters because killing first also acts as a defensive measure. Next think about where you want the Daemonic Pacts, your big core formations are good choices but sometimes adding one to something smaller like a unit of Chosen means you can transform a 4 stand infantry unit into an 8 stand major attacking piece (garrisoned forward turn 1!). It’s always worth knowing which formations you want to summon into while planning your turns, being able to suddenly shift the direction of an attack can really surprise an opponent and change their responses. Do not fall into the trap of thinking that each unit with a Pact must summon Daemons or even worse thinking each formation with a Pact should summon 1 per turn. The big strength is being able to suddenly add a considerable amount of extra power in one or two places each turn. One thing to note is that the Daemonic Pact is an upgrade to the formation itself, not to a single model in the formation. This means that so long as one stand remains it can summon daemons…that one random surviving rhino after lots of casualties can potentially summon in 6 stands of daemons from nowhere turning that easily ignored one model into 7 and all of a sudden become a major threat! Aside from the Daemons the list has various useful formations. The core one itself is a solid, heavily armoured, well equipped set of infantry good on both offence and defence, good in both CC and FF with a good threat range out to 60cm without needing to double. Commonly this formation will be deployed mounted in Rhinos and with a Daemonic Pact. This isn’t super cheap but it gives a strong, mobile force with the ability to spike its power by summoning. it can also be upgraded with many additional stands. 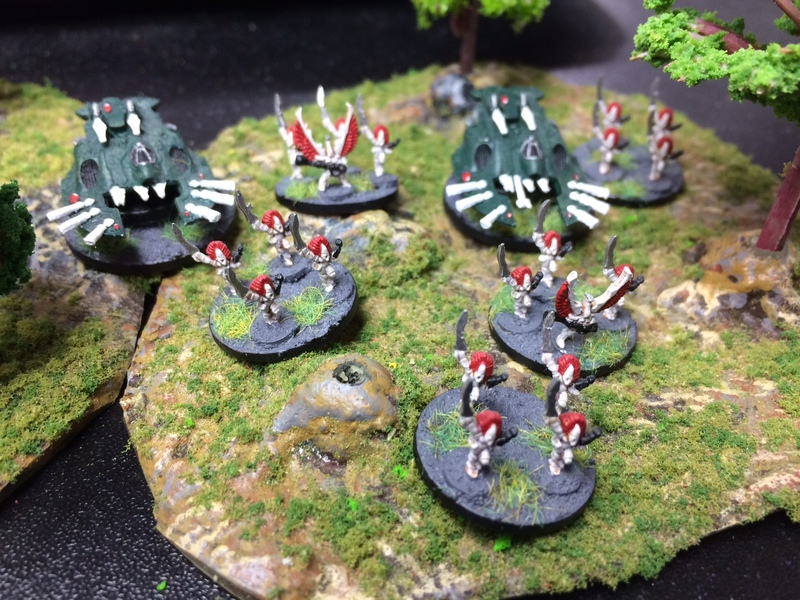 Other uses are to take them without the Rhinos and instead garrison forwards due to the 15cm movement and provide a firebase in the middle of the board or to mount them in Dreadclaws for an orbital drop. Mounting in rhinos is the most flexible and probably the most popular use however. These formations will likely for the core on your army, being both your attacking pieces or for holding ground. Often these formations should be the ones making engagements with the other elements in the army the support for them. The cheap, well armed Chosen are also fantastic as scouts. 145pts for the formation mounts them in rhinos for mobility and for 170pts they can have a Pact for summoning tricks. You also have access to Terminators, and can get up to 6 of them in a formation giving them even more offensive power than loyalist marines. However the loss of ‘And They Shall Know no Fear’ makes the chaos terminators far more vulnerable. An opponent will often place a few blast markers to break them and then just destroy them with additional blast markers, bypassing their fantastic 4+ reinforced armour. They also can get very expensive so really need to have a target and then ideally be in range to contribute further to the game. A one turn teleport to wipe out something and then having them stuck 80cm or more from objectives or other useful targets is a waste. Otherwise the rest of the army is both fast (with rhinos or by default) and potent on both attack and well armoured. You pay the points for this but it gives you a lot of flexibility to build a list matching how you want to play. There is another area with some stand outs. Warengines. The Decimator is a Baneblade equivalent with short range but powerful weapons while the Doomwheel is tough, fast and festooned with guns. The speed and flexibility of the Doomwheel makes it a very popular choice, rolling in to be a support fire element for any of the core formations, tough enough that it won’t just be chased off without the opponent committing real force to do so and even after the main fighting has been done the speed means it can dash out and contest or capture objectives. Overall the Black Legion is flexible and potent with many fun units to use. It tends to play more like up-armoured Imperial Guard than a loyalist marine chapter but that makes it sit in a unique niche. Probably the biggest thing to pay attention to when putting together your list is to not get too carried away with upgrades. Remember, activations can win you games! Though there is less of a pressing need for them when you can summon in Daemons where you need them, allowing you less need for having support fire moving along your main attacks and allowing you to transform small disposable units into potent forces all their own. I must admit to having never played using these, nor against them so I unfortunately have limited advice here! I will do what I can to provide some guidance though! First up the list is intended to represent traitor guard forces, cultists and other madmen and the mutants infesting Imperial realms. It also have access to the greatest volume of daemons (see the notes above for how useful they can be!) and Daemon Engines an almost unique set of units giving a host of flavourful options. You can put large numbers of troops on the table (and by can I mean will!) and then support them with a diverse and eclectic mix of other units providing a real bit of visual flair. The list itself is very abrupt with a few Imperial Guard units in the support slots giving the strategic and tactical flexibility an army needs and the standouts are the Stigmatus Coven and the Daemon Engines! These need to be either undivided or aligned to a specific god which determines the units and upgrades available as well as constraining what units can be taken in the support slot. 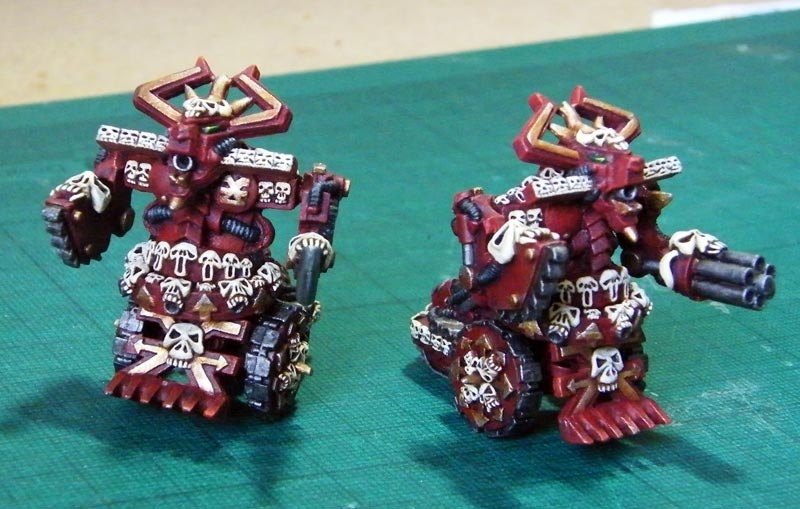 Remember, if you want to take a Khornate set of Daemon Engines you must first take a Coven aligned with Khorne. The Coven formation is very flexible, lots of options and lots of combinations allowing for you to really mix and match to suit what you want. I’ll point out some general features and then present a few possible combinations that might have some good uses. So the main coven is the core of the army that unlock everything else. It’s got some good flexibility with options for Mutants or Cultists. The cultists are basically guardsmen and carry a short ranged and mostly ineffectual gun, but weight of fire and the ability to place blast markers is helpful. The Mutants are a bit tougher and better in an engagement. There’s not a huge disparity here so choose your preference. The leader of the coven though gives more options, the Aspiring Champion is better as a normal leader with commander and leader abilities and is a better fighter while the Demagogue gives +2d3 to summon Daemons. The coven then can choose up to 4 upgrades (which contain much of the other Imperial Guard units like griffons) and one of those 4 choices can be a free Daemonic Pact. Note that the pact here does not come with a free Daemon for the Daemon Pool so you have to buy all your Daemons individually. Note also that the value of the Daemons changes a bit. The Flamers remain probably the best all round and it’s hard to go wrong with them. But the value of the Plaguebearers goes way up because the majority of your Coven is 6+ or no armour (or 5+ if in trees/cover) and having a wall of a few Plague Bearers (perhaps 3?) as the troops closest to the enemy so they take the hits first on their 3+ save is dramatically better than it would be in the Black Legion list (with their fairly uniform 4+ save). You can then also mount the Coven, adding to the cost fairly considerably. 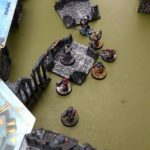 200pts naked (i.e. : with a Daemonic Pact) is competitive, mounting into the land transporters (which are pretty good too) makes it cost 260, adding in 2 Daemons to the Daemon pool is 40 so for 300pts you can get the formation, mounted and added to the Daemon pool. Which is not a bad choice. Something built like this is good to be a core fighting formation, the kind of thing you use to press forward and attack with, hold ground with, etc. Used in a similar way to an Imperial Guard Infantry company. Get the infantry in to cover when you can and be a general pain in the enemy side. A more defensive option could be to take the naked coven and add a single griffon. This costs 235pts but because everything is speed 15cm or less and only one model is faster than 15cm it can garrison. Which means you can start with an artillery piece half way up the board, in cover, surrounded by bodyguards that is able of indirect firing 60cm further. Now, it’s only 1BP so really won’t hurt very much but that’s a simple, reliable way of putting blast markers on the opponent, anywhere they are and it’s in a package that requires meaningful forces to shift from their position, most scouting forces will not go anywhere near it in a fight so it will need your opponent to commit proper forces to deal with it, otherwise they abandon the center of the table to them. Not bad for such a low investment. You can make this Garrison force even tougher by upgrading to add some big mutants or spawn though not the hounds as they are speed 30cm so can’t garrison). Doing this changes them from a cheapish thorn in the opponent’s side to something you want to be a proper combat unit. The Chaos Altar upgrade adds even more to your summoning capability, but loses you the ability to garrison (because it’s a warengine) and it’s slow so it makes the speed boost of mounting in transports moot. So by taking it you’re committing to ground pounding mostly unarmoured infantry over the table. As a defensive formation to sit on a blitz it’s good or something you can commit to a march order turn 1 to make sure it is relevant to the middle of the board early. It also makes the formation even better at summoning Daemons…except oftentimes it will be too far away and too slow to be able to make the most use of them (having a 30-35cm threat range on an engagement and a few 30cm guns with poor stats otherwise). The real standout upgrade for me is the Big Mutants. They carry poor guns (but can place blast markers), have a great save, have good FF and CC and a macro weapon attack and can come in large numbers. Taking a naked coven with a Demagogue, replacing 6 mutants with big mutants costs 320pts, mounting in land transporters for 90pts (1 for each big mutant, then 3 more for the rest of the formation) more and adding 2 Daemons to the pool for 40 more costs a total of 450pts. This is a big formation (6 big mutants, 5 other coven, the demagogue, 9 transports for 21 models) that is quick across the table and has a core of tough, dangerous fighters and the weight of numbers behind it to be a threat. Even taken in smaller numbers the Big Mutants (perhaps add 2 or so?) means you can hide your weaker troops behind them to absorb the hits and then bounce those hits on 3+, hiding some flamers of tzeentch behind a thin line of big mutants would be potent! Keep an eye on the CC only stuff though, CC is generally weaker than FF due to the ways an opponent can exploit CC only troops. CC only works on the attack and not when you are attacked (because your opponent can make sure they don’t go into base to base with you) and it also can’t provide support fire. If you do take it remember you’ll need to work a bit harder to make it work for you than you would with FF focused troops. Outside of the coven is the Daemon Engines and these are very varied and which ones you choose changes how the formation behaves a lot. Much like with the coven I will pick out some options that stand out to me as it’s just too varied to cover it fully! First up is the Khorne Lord of Battle. 400pts of warengine monstrosity, even coming as a terrifying pair for 800pts! It should fairly handily murder whatever it gets its hands on…hands being the operative word here. It’s biggest selling point is being brutally good in CC but it is only speed 25cm so it not that hard to keep away from. If it can’t CC it still has respectable FF and with high DC6 it gets plenty of attacks and outside of engagements has meaningful firepower. It’s just not going to be such a satisfying large amount! It you take it a pair is much more likely to have a major impact but it is a lot of points so it’s a real commitment to take it that way. The alternative is to use it defensively as a countercharge threat, they work better as singles in this way. Get one sat on an objective (such as your blitz!) and anything that is contesting that objective (within 15cm) should also be within your CC engage range of 25cm. If you are determined to use them as an attacking piece then commit to it and force your opponent to deal with them. Double or March into your opponents half and keep pushing on to their blitz. Marching turn 1 and doubling turn 2 means you can cover 75+50=125cm…the table is only 120cm across so you should be well able to reach your enemy blitz, have put blast markers on whatever is protecting it and engage it in CC turn 3, shredding whatever dares stand before you. The real goal is to make the opponent have to deal with you which means you may be able to get that CC ability in action more than once. Both Slanneshi options are fantastic, hard to go wrong with either. The smaller Daemon Knights suffer from being fairly easy to break and suppress and mostly relying on their firepower bu they are fast, fearless scouts with potent firepower. They should allow you to control the middle of the board from turn 1, chasing off enemy scouts and remaining a threat throughout the game. Just don’t expose them to meaningful enemy firepower. The Scout titans can be taken solo or as pairs (so long as you have enough coven of the right alignment to take them!) and both are very good. The Questor is probably the better solo option due to sheer weight of fire but the Subjugator with it’s CC (and long range ability to put blast markers down range or blow up transport vehicles) is terrifying. While CC focused units generally suffer in comparison to their more FF focused ones the sheer threat range and high base speed of the titan means it can usually get into position to catch anything it wants and then engage it to CC. Find the nastiest warengine your opponent has and utterly shred it. You’ll find that very satisfying. 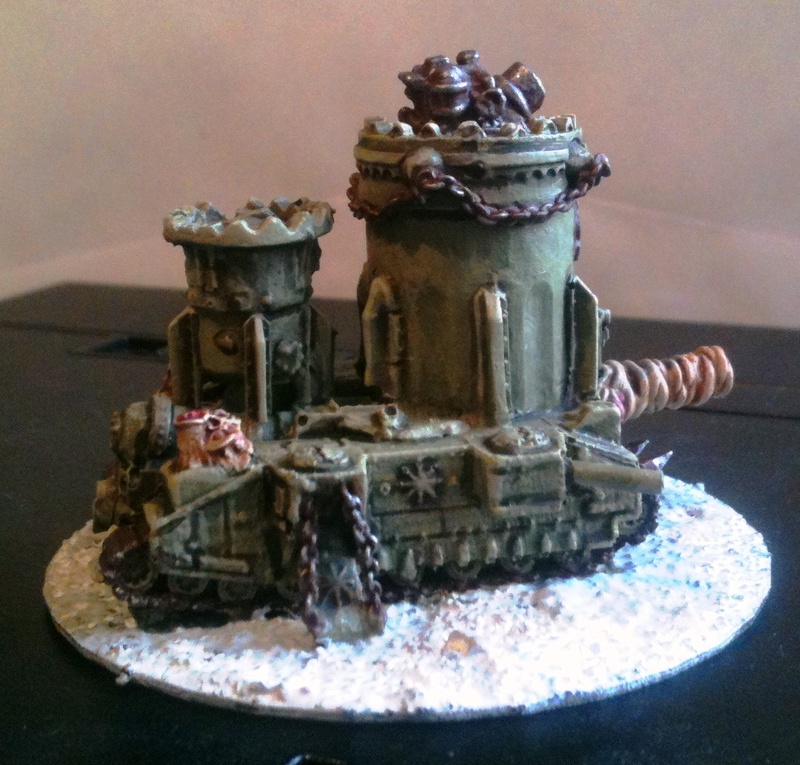 Father Nurgle provides some artillery support that competes, in my eyes, favourably with the basilisk. Indirect firing gives you 90cm of disrupt range, not quite enough to hit into the enemy deployment zone turn 1 bt they are decently tough and fearless. 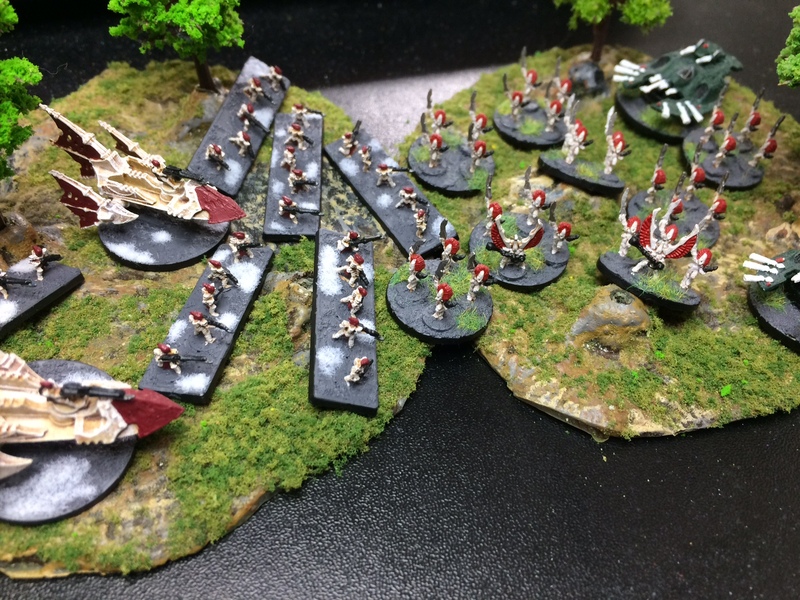 For the same points you could take 4 basilisk and have the ability to indirect fire anywhere on the board turn 1 which is also a very valuable option, enabling you to destroy enemy elements such as their own artillery, destroy a transport somewhere, etc. Both choices are good, though pricy at 325pts. Key to pay attention to when building is that you have tons of options and can bring tools in various unique ways to solve your problems. 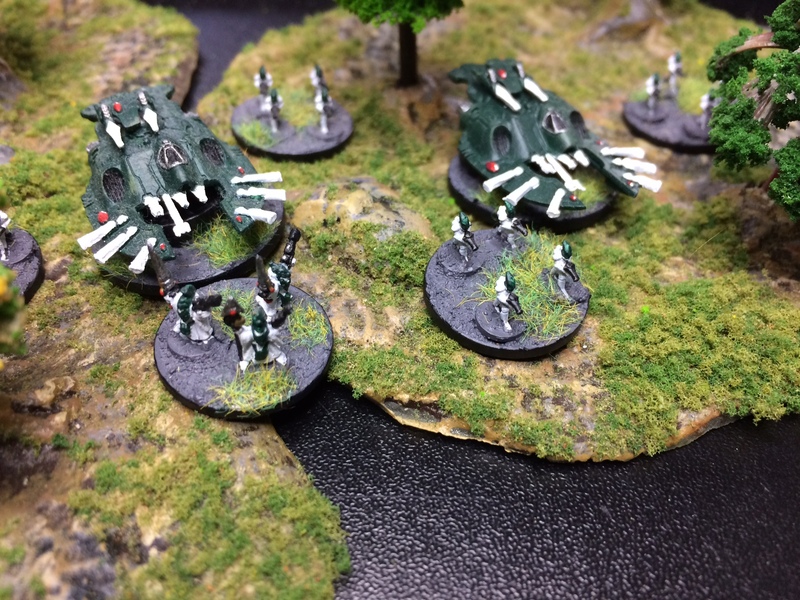 Think about the objectives and how you will secure them then take the units best able to achieve that for you…then make sure to spend a few points on something extra silly and fun that you like the look of! Probably the biggest thing to be careful of is overspending on upgrades, remember to have enough activations on the table too not just 5 massive covens with every upgrade going! The problem with taking 5 massive formations is that if your opponent has the standard 10 then they will be able to deny you any objectives by just moving around you with impunity after your 5 have activated and they’ll have 5 more actions to go! It also means they can potentially get their 5 extra formations in a support fire position around one of your big formations and…well…you might be big and tough but are you 5 formations optimally arranged by the opponent tough? From a modelling perspective this list is great though, plenty of freedom to make varied, colourful and diverse units and conversion. The Iron Warriors are an interesting list. Sacrificing much of the ‘chaos’ stuff in return for a few tweaks to existing formations, different availabilities of existing formations and a few unique units of their own. Focused very much on artillery, heavy firepower and armour. In the broadest sense this changes the way the list plays away from being able to exploit summoning and the new and unique options that opens up to instead play more like a heavily armoured imperial guard army. Slower and more methodical with standard reliance on supporting formations, prepping targets and engaging them as well as the volume of firepower to blow apart most support formations on the opponent’s side from safety. The first difference is that the core formations lose the ability to enter the table from orbit (as they can’t be mounted in dreadclaws) and so they will be on the table either in rhinos or garrisoned forward. They also cost more as they swap out two of their regular marine stands for two havocs, increasing the firepower and FF capability of the formation by a small amount. However, there formations have now moved from support slots into core – Defiler Packs and Vindicators and these open up a host of interesting options and allow a purely armoured force if you so desire. The defilers are potent, tough and good in both CC and FF and the shooting phases, they come with Infiltrate and Fearless and Walker making the surprisingly mobile and with a large threat range. They are expensive however and, while potent, that cost means you won’t get as many of them as you may have wished. It’s hard to go wrong with a few of them though! 6 of them is 405pts and throws out a great deal of CC damage and a respectable FF attack too. They are especially good at dealing with tough infantry on the opposing side with their CC macro weapon attacks, just make sure to destroy any skimmer transports those infantry may be planning on hiding behind first! The particularly interesting formation however is the Vindicators. Normally these are an upgrade or a small formation in their own right and by being small and often expensive or an upgrade they are rarely worthwhile. Here however they are a cheap(wish) armoured formation running 6 strong and can be upgraded to 9 strong for 355pts. These carry a lot of firepower good against both infantry and tanks, ignore cover, are fairly fast (25cm) and have walker to allow them to safely go through cover (which makes them faster than you’d think just looking at 25cm). The short range gun is a concern as using it puts them into engagement range…but they’re not bad in a firefight. If these guys can sit in support fire position they can add a considerable amount of raw power to any engagement. I’d strongly consider including a few of these formations in your list, mobile firebases able to get forward, dig out entrenched opposition and then add support fire to your more aggressive engagements. They pair great with some Defilers! There are two other main features the Iron Warriors have as their unique selling point. Access to sheer volume of Warengines and indirect firepower and artillery. You have access to Basilisks and can add basilisks as upgrades to many of your formations. The upgrade option is of questionable value as moving means you can’t fire indirectly…but the basic gun is still very long ranged and be either BP or regular fire. The cost can be a bit steep to add them liberally though as upgrades. However as a stand alone, indirect firing formation hidden at the back they give you many options, especially as the more indirect fire you have (without compromising your core attacking elements!) the more extreme the advantage they provide becomes. What these allow you to do is pick on the smaller, mobile or vulnerable formations of your opponent’s army with indirect fire from a position of safety. This means you can spend a few activations at the start of the game or turn where you don’t commit any of your forces to dangerous positions and can instead fire from safety. This in turn means you can hope to draw your opponent into committing their important resources forward but unable to attack effectively allowing you to react to them at your leisure. Furthermore you can use your artillery to pick on and bully those smaller formations your opponent is relying upon to give them an activation advantage, stripping them away to give you the advantage later in the game. Now, artillery is expensive and isn’t going to protect itself so it will need something to babysit it making the costs even higher. Don’t go overboard on it as you’ll cripple your attack elements. Remember, the artillery is unlikely to win you the game, they are support for the guys who will do the hard fighting on the front lines, not a replacement for them. 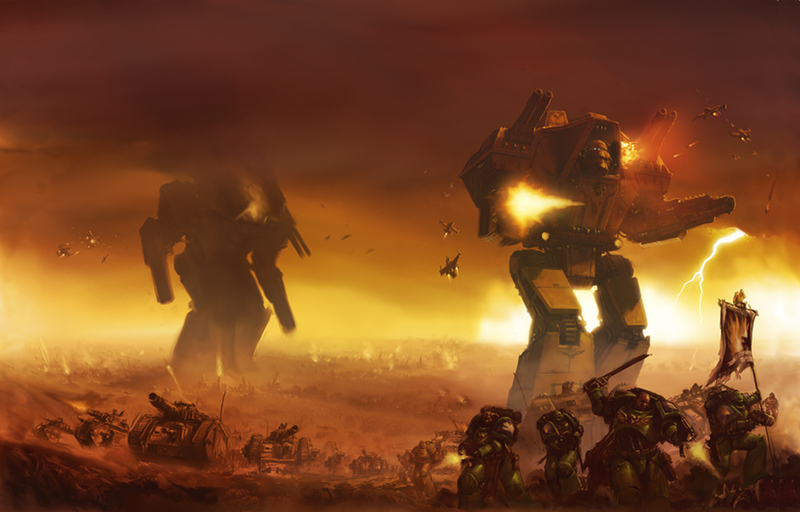 I would be remiss to not mention the Ordinates Chaotica, a stand alone war engine unique to the Iron Warriors. It’s a monster of indirect barrage fire, tough and able to protect itself against smaller formations. It’s kind of like a basilisk formation writ large. One of these and a basilisk formation is expensive but very satisfying and should give you plenty of indirect fire options! It won’t stand up to any dedicated attack units though, things like aspect warrior or terminators flying in on thunder hawks or vampires will tear it apart. So it, too, would need protecting. A screen of Chosen is good for this role (same for protecting basilisks). They’re cheap at 125pts and with scout can prevent the enemy getting too close to attack the tanks. The Chosen won’t chase off anything that’s a proper attacking unit but they will instead buy you time to move your artillery or other formations into position as the opponent will have to deal with the Chosen first. Finally your access to Warengines is pretty fantastic. You can take Decimators and Stormlords, both barrage weapon carrying bane blade hulls. Not cheap to take enmasse but singles of the Decimator are very dangerous and fearless to boot. Capable in engagements and a threat when shooting. The threat range on the main gun on both is 60-75cm depending on if you advance or double so is surprisingly large The other weaponry is short ranged so you’d need to be aggressive to get much use out of it, in both cases an early aggressive push of either doubles (to shoot garrisons) or marches should set you up to be a threat that needs to be dealt with. Luckily you’ll probably find that if you get some Daemons models and an Iron Warriors army…you can use it as both Black Legion and Iron Warriors with very little difficulty…two for one! Due to a new alarm system at the Park Barn Centre, and us not yet having the fob, a last minute cancellation tonight. Normal service resumes next week. Busy evening and thankfully much cooler with several players getting the new edition of 40k to the table. Mansions of Madness the board game. Fairly busy with a great mix of games. Of course the Shadow War campaign rumbles on. 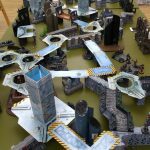 Busy again tonight with the finale of the Necromunda campaign and the continuation of the Shadow War : Armageddon campaign as well as a game of SAGA. 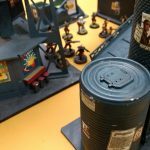 The Necromunda game should have a full report soon. This week we’ll take a look at the various Eldar lists in Epic: Armageddon, from the Aspect Hosts of Biel Tan to the cruel raiders of Commorragh. The Craftworld Eldar are a powerful and competitive set of armies in Epic: Armageddon with fantastically potent engagement troops, huge amounts of mobility, a whole array of movement and deployment tricks, titans, spacecraft and powerful shooting attacks. They aren’t the toughest troops out there but they’re not all that fragile if you make use of good positioning and some of the tougher units available to you. 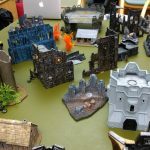 They do however have a variety of special rules from Webway Gates to Farseer retaining and require a good deal of practice to get your head around the different rules and how to make the different elements work in concert with one another to bring you victory. You’ll need to be comfortable with moving troops into supporting fire positions and how to prep your targets for your scalpel cuts and when to dash away for cover. The Dark Eldar are in many ways an even more extreme version of their Craftworld cousins. With some faster units, even more deployment tricks and even less durability. Knowing when and how to use your resources and when to sacrifice them to the Archon’s will is paramount. They are an extremely flavourful force, feeling like both pawns to Archon’s schemes for victory as well as sudden raider forces appearing from nowhere. There is only a single Dark Eldar list and 6 Craftworld Eldar from most of the ‘core’ named Craftworlds and each of these has a different style and emphasis allowing for plenty of choice in your preferred flavour and playstyle. There isn’t really a generic list that would thematically cover what the others can do (you just won’t get enough jetbikes in Biel Tan to satisfyingly mimic Saim Hann for example) so it’s a good idea to work out what interests you and spend some time fiddling with the lists to see if you can find one that suits what you want. 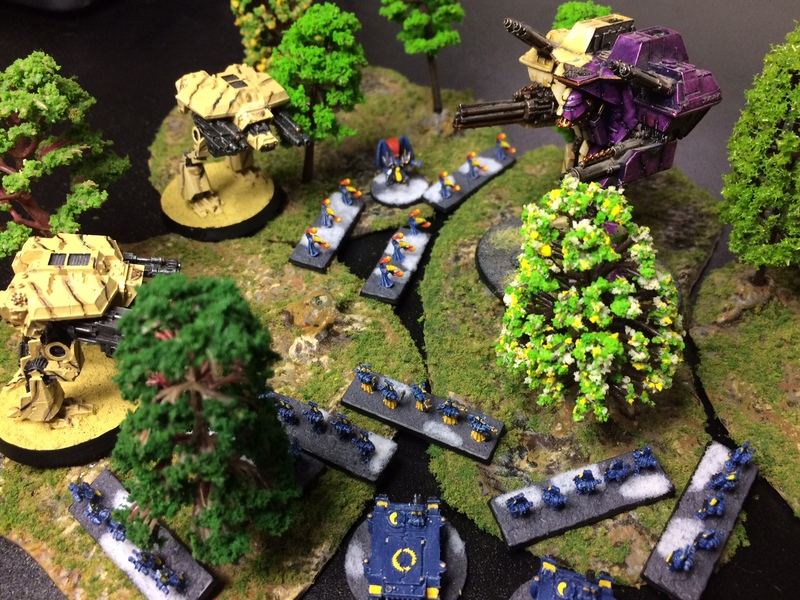 The aspects hosts of Biel Tan are a sight to behold, sweeping rapid attacks rolling from one engagement to another with potent aspect warriors leading the charge backed up by skilled vehicles and reliable guardians. The intended focus here is on using the support elements to deliver your Aspect Warriors right into the heart of your enemy and through a few decisive activations (that are usually Engagements) breaking the back of their resistance. The aspect warrior formations of Biel Tan are quite large and can be expensive if you mount everyone up in transports but they are also incredibly flexible. You can mix and match the aspect warriors freely so a formation with 2 firedragons, 2 striking scorpions, 1 swooping hawk and 3 shining spears with 2 wave serpents is perfectly fine and this flexibility allows you to both tailor them to a specific role and to control your point expenditure on them (hint: Wave Serpents can be costly to transport the slow infantry aspects but taking a few infantry and wave serpents and mixing in the faster hawks or shining spears to fill in the rest of the formation means you can be both fast and cheaper than fully mounted). The general use of these formations can vary based on what you put into them – 8 Swooping Hawks is a very different formation to 8 Fire Dragons but broadly these are what you use to crack the hardest enemy formations so need to get there in one piece. Wave Serpents are one way of doing this but can be comparatively vulnerable on the approach. Instead making use of the fantastic deployment options in the Eldar can deliver these guys where and when they are needed. 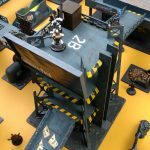 Using the Webway to be able to come onto the table from further up than the deployment zone or using the Webway gate on a Storm Serpent to appear anywhere or using the Vampire Raider to fly and air assault from safety. Typically the CC focused aspects are less popular – Banshees and Scorpions – while the Firefight focused ones are seen more often. This is mostly due to the huge rolling engagement potential of the Eldar with their hit and run rule meaning that Firefight focused formations can deliver all of their specialist attacks multiple times over a single turn while a CC formation is far less effective at delivering its specialist threat multiple times a turn. Of these the Firedragons and Dire Avengers (with exarchs!) are popular and very common and entire formations of Warp Spiders are frequently used in Vampire Raiders. Because Warp Spiders have the Infiltrate ability they can land in a vampire, wipe out a foe and remain a threat out to 45cm meaning they suffer considerably less from the lack of transports that air assaulting necessitates. This is not to say the CC aspects are bad, just that they don’t play as much to the strengths of the rolling engagement style play. Another key point of the aspect formations is the Exarchs. You can have up to 2 per formation and – unless you have a very specific plan that doesn’t need them – you will be taking 2 every time. They increase both the attack power and also provide the Inspiring ability twice to their formation which can be a huge advantage when it comes to combat resolution and seeing as you will mostly want these guys to be Engaging that helps a lot. Outside of aspect warrior shenanigans the list has a set of other strong options. Rangers are great scouts (keep them cheap at 100pts, you’re better with 2 4 strong groups than 1 8 strong group), falcons with firestorms for air defence and for destroying enemy vehicles (key targets are rhinos, chimeras, etc. that transport infantry as destroying one can slow the down the entire parent formation or the enemy risks leaving troops behind to keep up their speed). Void Spinners and Night Spinners for barrage and the ability to put blast markers where you need them or to break smaller enemy formations. Your aircraft are among the best in the entirety of Epic, they pay for it but they can lock down enemy air assaults or cause punishing damage on the enemy. Using your ground troops to eliminate (or suppress) enemy ground based AA weapons to give you freedom of the skies is advised. Guardians are also great – if they have some cover to hide in! – and bring the critical Farseers to enable some of your nastiest tricks. jetbikes also work great for support fire and bringing along one Vyper in the formation (so it can shoot and put blast markers where you want them) is a good idea too. Tactically you need to get comfortable with how the supporting fire rules work and how you can use the fantastic Hit and Run rule in concert with the triple retain capability of your Farseers to allow you to keep reusing your troops combat ability in a single devastating attack. A common example would be if your opponent has two formations within 15cm of each other A and B. You double some jetbikes (with their Vyper) to sit between both A and B within 15cm of both, they shoot the Vyper at formation A (dealing no damage but placing the blast marker). You retain initiative and assault A with your Firedragons, their pair of exarchs and their Wave Serpents making sure to get at least one member of enemy formation B within 15cm of your firedragons (so that they receive a blast marker when A loses), the firedragons (with the jetbikes support firing as they are within 15cm!) shatter formation A (and this places a blast marker on B) then the firedragons use the hit and run rule to move up to 15cm to make sure they are within 15cm of B with as many models as possible. You then retain a third time (which only the Eldar can do!) and engage B with a formation of guardians (or something, anything really) and this time you get the jetbikes, firedragons and your third formation all attacking B (because you have the jetbikes and firedragons in support fire positions) to annihilate B too. Using three formations to annihilate two enemy ones and getting to use those jetbikes guns three times in a row, the firedragons get to use their twice in a row (which CC focused aspects could not do) and your third formation got to use their once…but could use hit and run to move to another good position to support an attack elsewhere on the table (or just duck for cover!). This list is all about speed and the 35cm consolidate move. Saim Hann look great on the tabletop with wave after wave of jetbikes screaming across the board. They need to make maximum possible use of hit and run tactics by hiding behind cover and engaging units from up to 50cm away then consolidating 35 freaking cm to lend support fire to another assault. When they’re played right they can use the elder rolling assault like no other army in the game. They’re also great at picking off isolated units and using their 35cm consolidate to redeploy and threaten somewhere new or get back to a place of safety. Key units are the Wild Rider hosts with 9 jetbikes and the potential to add 3 more plus a mounted farseer and a single wild rider chieftain per army. Both characters are must haves in order to give you the all-important supreme commander reroll plus farsight and the ability to summon the avatar. While the latter isn’t as strong as in Biel Tann he can really tip the balance for your big jetbike units when assaulting tougher targets like dug in imperial guard or big units of tyranids. You can (and should) add vipers for the all-important ability to place blast markers and their better 4+ armour. Wild riders will make up the core of your army. Aspects are a little different, basically they have to be fast (ie hawks and spears) or mounted up in wave serpents. If you’re mounting up you gain access to stronger aspects like dire avengers and fire dragons but only a maximum of 6 with one exarch. If you’re spears or hawks you gain 8 and the excellent double exarch (so double inspiring) and they become a core choice. Spears give some much needed armour busting capability to the list with lance. Hawks I find less useful as their key strength is speed and the ability to strike almost anywhere and the whole of your army can already do that. The mounted aspects are always solid and give you a slightly tougher BTS than a wild rider unit. Saim hann get access to all the usual eldar support units including the wonderful rangers for screening, stall activations, late game objective grabbing and sneaky sniper shots on enemy characters. Falcons with firestorms are a must as always. Saim Hann are fragile and need AA cover plus they lack long range shooting so falcons ago-go. Eldar aircraft with Macro-weapon? Yes please! At least one vampire hunter is a must they’re great for dealing with better armoured targets but also for sniping out small fragile units such as scouts. So why aren’t they trouncing all comers at tournaments? Well… even by eldar standards they’re fragile. The bike units are 9-13 strong with 5+ armour, they can’t make use of cover like infantry and (unless you’re running storm serpent webway gates) have to start on the table so they’re extremely vulnerable to artillery, air assaults and ranged shooting in general. Their assault power and ability to activate reliably dies away quickly with blast markers and casualties. On the subject of assault power, Saim Hann lack numbers, macro weapon, and good armour in assaults so can struggle to take down really solid targets (tip using commander from your farseer or chieftain to combine an assault can help). Lastly, they struggle to have a sturdy BTS. Essentially, you have 3 options; bikes, mounted aspects, or revenant titans. Of these the latter are the toughest but by far the most expensive and give you great shooting but less on the assault front. The aspects are always on the board, and once the jetbikes are on board (if they deploy via a gate) they are also always on the board (lacking the Biel Tann BTS safety in vampires option) so very vulnerable to being broken and then, due to not being fearless simply picked off. All in all, a really fun, really thematic army that are hugely enjoyable and occasionally very frustrating army to play. The wraithhosts of Iyanden are different from the other eldar in that they are absolutely rock solid and very difficult to destroy. They pack a huge punch and can almost look after themselves with much less need for supporting formations in engagements (though you should bring those along anyway). However they are a list that really suffers at lower point games and only really come into their own at closer to 4kpts where they have the points to buy both the wraith formations and the transports to deliver them to the enemy. You can rely on your core Wraith formations to win most battles. They benefit from having support fire and want to see their targets prepped with blast markers before going in because – while tough and powerful – an engagement has a lot of dice being rolled both for and against you and the end result is usually pretty decisive so don’t take a risk if a little bit of support can cut that risk dramatically. 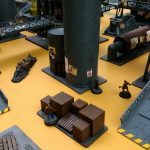 A lot of the time you’ll be looking for suitable ways of delivering these guys to the table – Storm Serpents, Webway Gate, Vampire Raider are your best bets – and getting them stuck into the fight. Slogging across the table with a 15cm speed is not recommended and will likely leave them unable to every actually fight as they can be easily delayed with scouts or enemy maneuver. Unfortunately this transport requirement can get costly. Luckily you still have access to the cheap core Guardians (in a less attractive configuration with the heavy weapons by default) to bulk up your activations and the great Eldar support formations like Falcons (with firestorms! ), Jetbikes, Rangers, etc. while also having access to the cheaper (and smaller) aspect warrior host. These aspects lose the ability to take double Exarchs (take the single!) and generally you’ll want to choose the aspects that are faster by default – swooping hawks for example or Warp Spiders (due to their Infiltrate ability) that allow you to remain combat effective whilst not having to invest in a lot of supporting mobiliy infrastructure (remember also that you can only have 3 formations in the webway and each gate can only be used once per turn so there is a limit that can’t be overcome with just more points and if your Wraith troops are in there then less room for your aspects in the first place). Remember though that your support formations are also actually pretty strong in a fight. This isn’t a case of shepherding your wraith troops in as your only attack options. There are a lot of useful formations and attack stats mixed amongst those support formations so you can build a good attack with just those while you wait for the opportune moment to launch your Wraith troops into the fray. They just take a bit more finesse to use to that effect. All in all this list really there if you love the Wraith troops. It revolves around them and has a lot of powerful options with them. It’s competitive but struggles at lower point totals whilst coming into its own at slightly higher than normal (3k is normal, 4k is where this list really shines). A pretty different experience here, focused heavily on scouting forces and relying on the smaller (smaller than Biel Tan anyway) aspects and support formations to do the work of actually breaking the opponent’s forces. They also sacrifice the flexibility of being able to drop lots of small 100pt ranger formations for the larger ones (which normally you’d not take in the other lists). In return you’re gaining access to Ranger and Ranger+War Walker formations (11 scouting models with mostly anti infantry guns for 275pts) as well as Pathfinders. Remember, your rangers and War Walkers can garrison forward near the midway line so they can be right in the thick of the action immediately and u to two garrisoned formations can go onto overwatch during deployment. 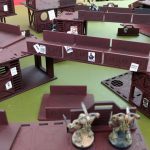 The ready access to so many scouts gives you huge area control, able to spread out and have layers of scouts rendering any possible advance or landing point for the opponent a slog to fight through. This gives you the ability to dramatically slow your opponent for your more impactful elements to get into their supporting positions and destroy the enemy piecemeal while they have little ability to coherently organise a response. It also means that you can contest and block enemy contesting of objectives extremely well in the later stages of a game. Played well this means you can r=turn a loss on turn 3 into a turn 4 and a draw by just being extremely frustrating and not allowing them to score their objectives. The unique unit here is the Pathfinders and they’re fantastic…in a different army. Being teleporting scouts is hugely potent, able to utterly stop an enemy critical attack or break up a firebase in a way that’s almost impossible to stop. (Hint: if your opponent has weapons that fire indirectly you can teleport a Pathfinder so that the enemy formation has a model inside your 10cm zone of control, this means those indirect fire units can’t sustain to fire indirect as they have to move out of your 10cm zone or engage you, either way you can silence those big guns for a turn). The first strike is also helpful, especially considering their low armour and limited attack stats (6 stands, 5+ to hit, average 2 hits). The issue they face in the Alaitoc is that…do you really need more scouts considering how many you’ll have from your core formations? Broadly just by taking your core ranger formations (and some Pathinders, they’re still useful, just notably less so than they would be in other armies) you should have a massive ability to control the board, but generally lack the hard hitting elements to actually attack the enemy effectively. That’s where your selections in the support slots come in to give you your attack power. Pick formations that will be able to get into position to attack and support each other to take advantage of your scouting ability to cut the enemy table positioning apart and then retreat to safety. Don’t neglect your air defence – having someone air assault a formation into your scouts, break them and punch a huge hole in your defence field is not advisable. This also gives you the benefit of being able to use your own air assaults more freely. Two things to pay careful attention to due to the abundance of scouts. Spread out into a long string scout formations can be very vulnerable to clipping engagements where only one of your stands can fight against a whole enemy formation, making a defeat very likely. Pay attention to your opponent setting up for clipping engagements (usually by placing a blast marker on the scouts and engaging them with a formation of their own that doesn’t have any blast markers, especially if the enemy formation outnumbers your scouts and/or has Inspiring). Second thing to pay attention to is intermingling your formations – if your formations have models within 5cm of each other the enemy can engage one formation and force the other to fight and break as one which you might not want. This is double the case with stringing out a scout formation. Having the enemy engage one scout on the far end of the tail, intermingling a formation 60cm away that you left too close to the scouts and watching as that one clipped scout breaks a core part of your army is eminently frustrating. Overall a very different army to play. Not necessarily the strongest you’ll see, especially as the point totals increase but at lower values (1k-2k) it is very difficult for an enemy to deal with so almost the opposite of the Iyanden. Better the fewer points there are! Guardian focused and potent (because Guardians are a great unit) due to shenanigans with Strategy Ratings. Your Guardians are slightly more expensive than normal as you get a second farseer unit in the formation, this is mostly a good thing. Looking at the list on paper and there’s not a lot that jumps out as particularly exciting. The unique unit is having an extra farseer stand in the Guardian formation and 6 aspects is not a stand out unique thing as the non-Biel Tan all have that too. The selling point for Ulthwe is the combination of fairly cheap core Guardian formations, not losing access to the general tools of the Eldar (rangers not forced to 8 man units, guardians not forced to use heavy weapons), cheap (due to 6 stand units) aspects (remember mixing in infantry ones mounted in wave serpents with fast movers like hawks or shining spears to keep costs down and mobility up) and the ability to get the equivalent of strategy 5 for one turn (and strategy 5 for deployment tricks like teleports and spacecraft). It’s not a particularly exciting list one must admit, more fiddling around the edges but the overall effect is to allow you to often squeeze in another formation or a few more upgrades and by using the core tools of the Eldar and their skill at rolling engagements you can often win fairly healthily. The biggest advantage you have is consistency on Turn 2 Strategy. For most lists going first on Turn 2 is a fairly major advantage – you’ve spent turn 1 getting into good attacking positions and weakening your opponent for your attack to start – and the Strategy 4 with +1 from summoning the Avatar (which should be in range to attack effectively on turn 2) means you have a very good chance of getting to go first and launch your attack decisively before your opponent can launch theirs. It’s a small difference but it can be game winning. I have never played with nor against this list so I have only limited insight, though from those who have played it I have heard it suffers from lacking a decisive attacking element. 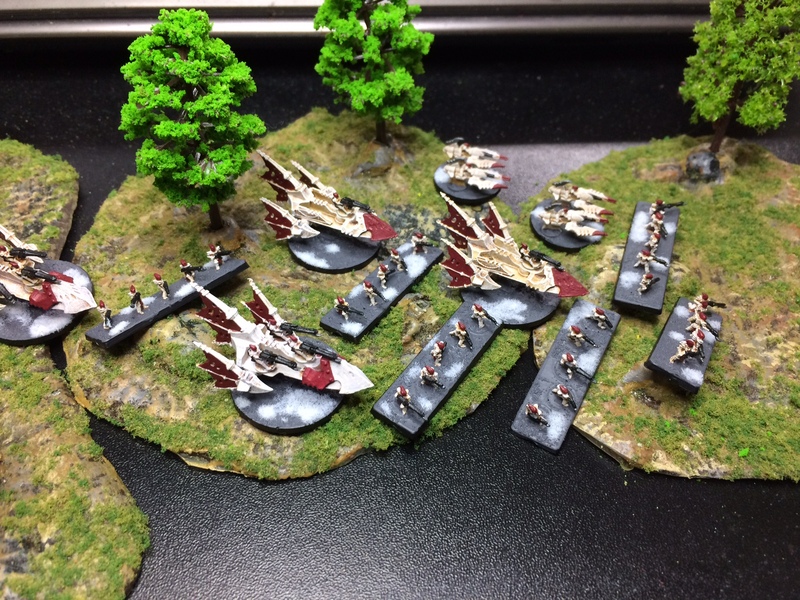 Yme Loc gives you all the vehicles, all the time, flights of elder skimmers hit and running into range, firing and withdrawing back out again, swift moving mounted infantry and access to a few units no other eldar have (Hornets, Lynx, Warp Hunters, Large Webway). 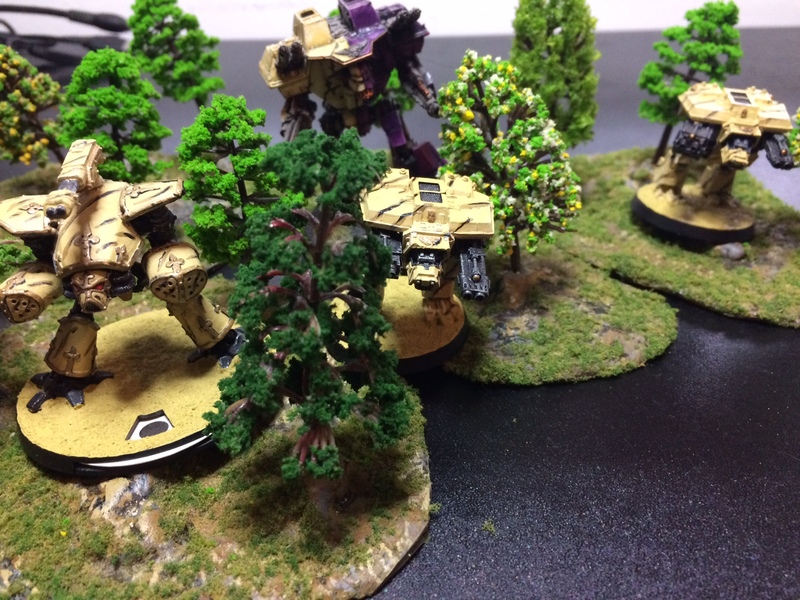 In return though you’re losing flexibility in your formations make up, lose the ability to have cheaper foot based infantry and thus losing many of the special table entry options – no teleports, planetfall or air assaults with the units you’d normally want to do that with. At first glance the weight of firepower you can bring is fearsome, able to badly damage formations at medium and close range while you then move your mounted infantry into position to launch your finishing blows. The intention for the list is a combined arms style with the vehicles doing a lot of the heavy lifting early on to be followed up by the mechanised infantry forces to defeat the crippled enemy and seize the objectives at the end. However. The essentially skirmishing your vehicles are doing early on, relying on hit and run, means that you’re frequently doubling your vehicles (not always, but often if you’re not doing that you’re leaving yourself vulnerable to return fire) which can dramatically cut your firepower effectiveness, especially against infantry due to the ease with which they can claim cover. Remember a 5+ to hit on a double becomes half as effective. 5+ is 1/3 hits, while 6+ is 1/6 hits. For the Yme Loc I suspect you’ll be taking on a challenge. Forced mechanisation costs more points and limits your deployment options and the fragile nature of your vehicles means that you can be forced to use double orders a lot to keep them safe, which cuts your effective firepower. You’ll probably look fantastic on the table though! The dark pirates of Commorragh. Fast, deadly and oh so squishy. I love the Dark Eldar, it’s an extremely well designed list from a thematics point of view and plays in a pretty unique way but suffers from some fairly major weaknesses and has a larger than normal contingent of questionably useful formations. Broadly the list shares many of the features of the Craftworld Eldar just turned up to 11. You’re blisteringly fast, have some powerful (though CC focused) shock troops and die when someone looks at you funny. You can have an entire army that is only on the table in the place and time it needs to be there to maximise its offensive potential (and then dies once it has done its job). A big contributor to this is the Raider. A 35cm move light vehicle skimmer transport. It’s really quick and quite vulnerable as being a light vehicle anything can hurt it (so a passing scout formation with heavy boaters for example can blow it out of the sky and cripple the speed of your formations). One thing that is special though is that being a light vehicle means it can use the Webway Portals (and note the plural!) that you can bring. 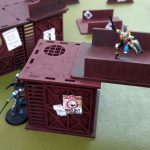 This means your 35cm movement skimmers can enter the table form a portal that is potentially all the way up on the half way line of the board (or even deeper on with the portable one). Raiders in the web way should give you the ability to reach almost anywhere at almost any time and deliver your troops where you want them. Some people consider the list restriction that requires you to have the Archon’s Kabal as the BTS a disadvantage but personally I’ve always ended up with that Kabal as the most expensive formation anyway so it barely registers. The Lord’s Kabal has Incubi and can run with 6 of them (and some warriors too) for a healthy 12 CC 3+ attacks and a 3+ MW CC attack from the Lord, has inspiring and 4+ saves and the speed and deployment options of your army mean that you can usually guarantee these guys arrive on target when you want them and never be vulnerable to enemy attacks until that point. These guys are the best your army has to offer in the shock department. They do however only work on the offence due to their CC focus (they’re terrible at FF) so expect to see them suffer badly if the opponent counterattacks them. They’ll want to make their attack and then run to hide as they will be a key target for the opponent to finish them off. 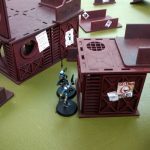 Your ability to deploy on the table from off table is second only to the Necrons, meaning your pirate raiders can literally come from nowhere, launch their attacks and then run to hide to enjoy their stolen prizes. This is achieved by having the Webway (which means up to 3 formation off the table), Scourges (a fantastic FF unit with great mobility) can teleport onto the table, Mandrakes (great at seizing ground, blocking movement due to being scouts, CC and FF) can teleport in and you have the absolutely fantastic Slavebringer to do either planetfall or air assaults. I commonly leverage these heavily and will have maybe 2 formations on the table at the start of turn 1 (both of which are Vessels of Pain as they’re able to do useful work and keep themselves safe while doing so) and then bring units onto the table as and when they are needed. When playing a list with this much off table materiel your early work should be to clear the way for your formations to enter the table. Find and destroy or suppress ground based AA, fight their aircraft out of the sky (and if you can’t manage that the Slavebringer is still pretty tough due to the Shadowfields making it hard to hit and ablating the first hit anyway) and with anything spare place blast markers on your targets (to make your attacks when you launch them more likely to succeed) and get into supporting fire positions. When selecting your targets you need to think about how attacking it will secure you objectives at the end of turn 3. A sad fact of the way th list is designed is that you need to be laser focused on those right from the off if you want be winning. That does’t mean start standing on the objectives on turn 1. That means think ahead about how what you’re doing will secure the objectives you need to win. Sometimes that means not attacking a powerful enemy at all or isolating them so they can’t stop you scoring. For example you might see a potent enemy formation that could move to contest an objective and thus stop you scoring it – teleport those Mandrakes in to block their ability to move like that, even if that means the mandrakes die or never get to fight anything at all, if they secure that objective by blocking a key enemy unit for a few C centimetres then they’ve done their job. The Mandrake example above also leads to another key point. Everything is sacrificial to the goals of the Archon. Any formation can and should be thrown into the jaws of death so long as they achieve what you needed of them first (which is eminently thematic for a Dark Eldar Lord!). A good example of this is Wyches+Warp Beasts+Succubus in a Slavebringer (that’s two formations for 500pts). These guys are great, able to surgically strike a target, land 6 CC3+ first strike, 4 CC4+ first strike and 1 CC3+ first strike macro attack (plus shots from the slavebringer) and hopefully win before the foe even gets to strike. These are almost a suicide missile, find your target, destroy it and run! They are a premier strike force and if you’ve done things right they come swooping in on a target that has blast markers already and your guys come in without them giving you a +3 to combat resolution right from the start (the succubus is inspiring!). They’re almost certainly going to die afterwards though and because they came in from the sky don’t have their raiders to rapidly move elsewhere to help out other fights. Now onto the downsides. There are 3 main ones. 1. CC focus, 2. you die super fast and 3. uncompetitive units. The CC focus on your shock units means that they can’t do a lot of supporting of each other as their support fire attacks aren’t all that great it also means that on the defensive they will never get to use their CC values unless they’re worse than their opponents. I.e. : if an opponent engages your CC troops they will FF them and position to make sure you can’t get into CC so your super elite Incubi will be stuck in a firefight with a guard infantry company or space marine devastators or fire dragons or something (look at the Haemonculi coven, if the enemy engages it in a FF the bulk of the units literally cannot fight as they don’t have a FF value!). The other major issue they will face is an opponent with Skimmers. You can never CC a skimmer unless the owner wants you to (which will only be when it’s to their advantage!) and canny players of things like Eldar will hide their troops behind a screen of skimmers forcing you to get at least a few of your models engaged with those first, wasting their CC potential. Dying really fast is a fairly major weakness! It’s an exaggeration to say it but it can at times feel like if your units are on the table they’re dead. If your formations are in a position close to the enemy they can easily come under attack and if they do they will die or lose effectiveness very quickly. The CC focus above compounds this as the units can be very mono focused and thus can have their ability to do their focus degraded rapidly making the formation very little use except as fodder, blocking or contesting. Frequently your formations making their surgical strikes will kill a lot of enemy and take crippling casualties afterwards (another reason the Incubi with their 4+ armour and Wyches with First Strike are so good, they’re less likely to suffer this!) making them one use only. You have to choose when and where you expose your formations to danger because if they are in danger they will likely collapse under the weight quickly. This weakness also manifests in the base of Dark Eldar everywhere. Overwatch. 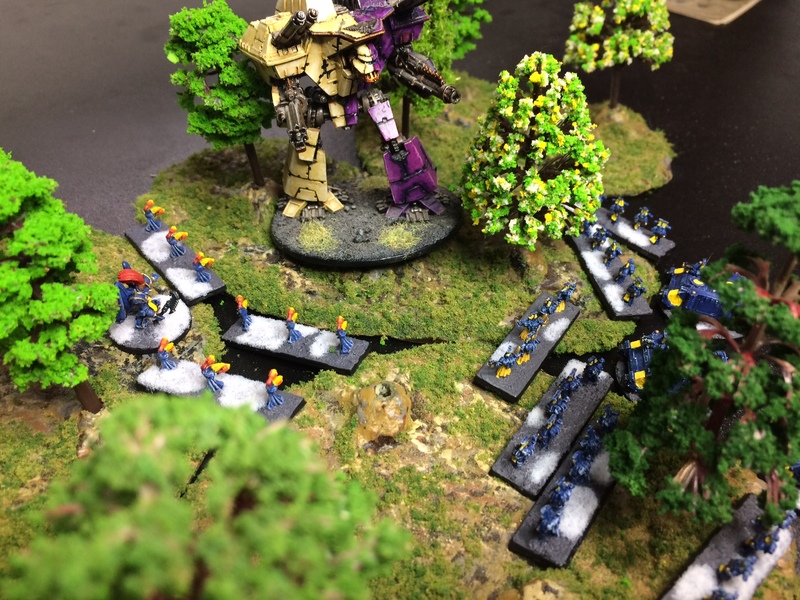 An enemy formation on overwatch is a thing of fear – able to place blast markers on your engagement troops weakening them in the fight resolution at best or destroying many models before they ever get to attack at all at worst a few well positioned formations on Overwatch can stymie your attack entirely. Overwatch combined with the light vehicle nature of Raiders is also a nasty double whammy. Random scouting forces on Overwatch can shoot your Raiders as they pass and stand a not insignificant chance of blowing one out of the sky in passing, potentially killing the guys mounted and even if they don’t stranding the infantry on the ground slowing the rest of the raiders in the formation. You may want to carefully plan your moves to avoid this happening to you. Number 3 is not a unique problem to the Dark Eldar. Everyone will have a few duds in their list or units that just don’t do their job as well as other units. It however feels a bit more extreme for the Dark Eldar as so many formations have the same use – CC shock units. This means you’re often selecting your units for a role critical to the Dark Eldar way of war and then ignoring many of the units supposedly for that role. I know I only use Incubi and Wyches for this role and when trying the Haemonculi and Talos out they always disappoint. 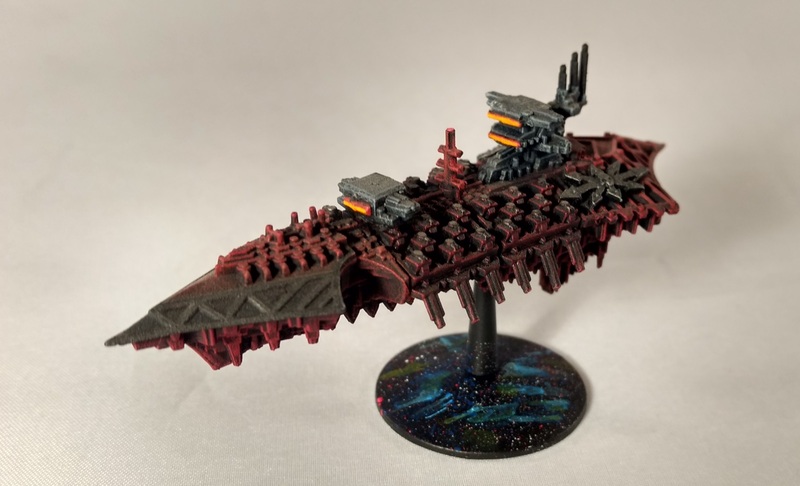 The Kabal Flotilla with the Ravagers is scary on paper but usually does very little of use and competing against the excellent firefight support capability (something the list sorely needs) of the Warrior Kabal (which is also cheaper!) it’s hard to justify. It’s unfortunate but many of these characterful formations are just not making their way into armies that see the table. Overall the Dark Eldar are great fun to play, tense and cautious play until you unleash havoc and suicide your way to victory. You will need to know how to handle placement and movement routes, how to block and corral your foe, when to sacrifice something for victory and when to conserve your strength. Pay attention to supporting fire form your own formations and those of your enemy, know how you’re going to get into CC and above all focus on how you’re going to score objectives on turn 3! Hopefully there’s something useful for you here. 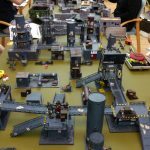 Shadow War : Armageddon Campaign Hub for the current standings.